40mm. One of my favourite focal lengths. Long ago the Voigtländer 2/40mm Ultron was glued to my Canon. Even longer ago, the Zuiko 2/40 was a favourite on my Olmpus OM film gear. The 40mm equivalent 20mm Lumix was my favourite lens on the M43 gear I used to use for travel and hiking. So naturally a native 40mm full frame lens for E mount has me very excited. That slightly wider than standard lens look (close to the theoretical ‘normal’ focal length of 43mm) gives a lovely, natural perspective that leaves the photographer, rather than the angle of view, in charge of the image. But of course the cost of the slightly wider angle of view is less potential for bokeh; the nice, isolating, out-of-focus blur that people prize in people photography. That’s why the speed on this lens is potentially so great. Perhaps f1.2 sounds extreme, but the actual blur potential is about the same as f1.4 on a 50mm lens. 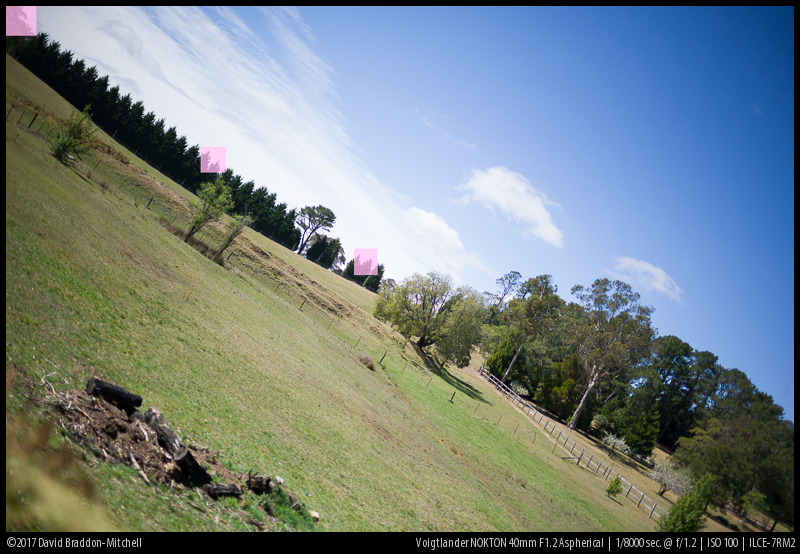 So in order to keep up with a 50mm lens in terms of blur, you really do want a bit of extra speed on moderate wides. 40mm is a great length for portraits which place people in a context: but you don’t want that context to dominate, so being able to see the context but have it nicely blurred is a fantastic combination. But what price do we pay for that? Is the IQ on this surprisingly small and fast lens good enough? Thanks to Mainline Photographics who are the Cosina Voigtländer distributors in Australia, for the loan of a review copy. Note on one sample: Note: much later a reader pointed out that the in focus area of the f1.2 image of the Bottlebrush (Callistemon/Melaluca species, the red flower) seems to be sharper you would expect. I agree, and wonder if something has gone wrong here. Elements/ Groups 8/6, two double sided aspheres. The lens is available now in Japan and Australia (in Australia from Mainline Photographics). Buy it from from our affiliate link at CameraQuest, B&H Photo Video or our link to eBay. Buying through our links costs you no more, and makes a small contribution to running this blog. The overall size is extraordinary for such a fast lens. You can see from the on-cmaera image that it is a nice match for the body, and the comparison photo below shows it considerably shorter than the classic Zuiko 1.2/50 (itself by far the smallest classic f1.2 lens). The slightly slower Sony Zeiss 1.4/35 towers over it, and the considerably slower Loxia 2/35 is a little less fat, but roughly the same length. This size factor is a very serious advantage for the lens: it means it’s not a special purpose ‘bokeh’ lens to be brought out when you want especially thin DOF, but something you can use as a genuine standard lens, your go-to walk around lens. The handling is gorgeous, if handling can be gorgeous. The focus ring is buttery smooth and responsive. It balances beautifully on the camera, being remarkably small and light for its size. There is a declicking ring should you wish to turn the aperture clicks off for video usage (like all the other E-mount Voigtländer lenses except the 65mm). The hood is small enough to leave on permanently, and if you do, the lens cap fits easily inside the hood. I start with an aperture series of a scene at infinity, with the lens focussed at the centre of the frame. Here is a complete frame to give a sense of where the 1:1 crops are taken from. The following set of crops show good but not outstanding results in the corners stopped down. The lens is however capable of excellent corner resolution, but it has some field curvature which needs to be accounted for, and yo have to take focus shift into consideration. 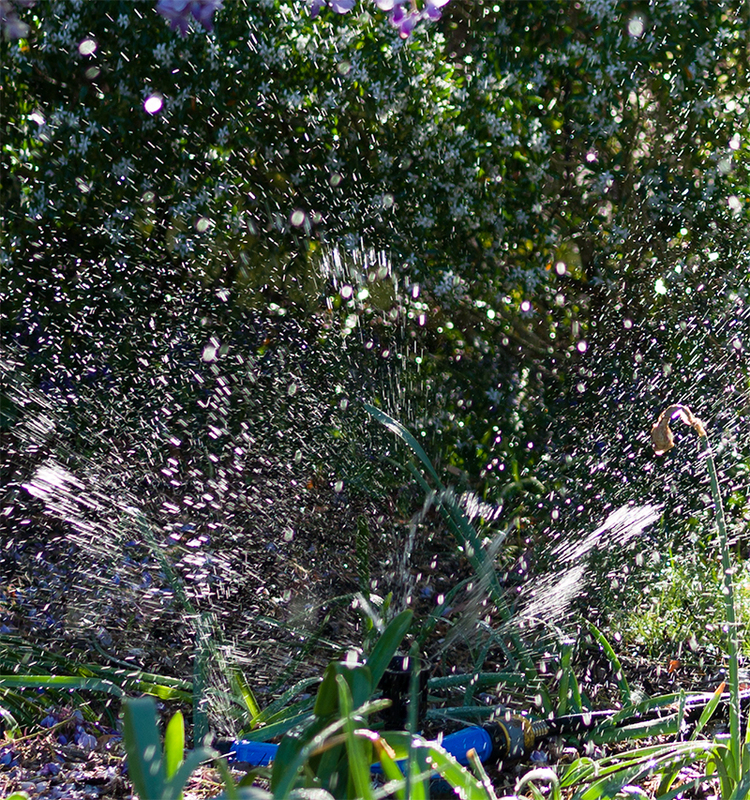 I will show some crops illustrating this behaviour after the initial standard set of crops. Focussed on Centre: At infinity, it is sharp centrally from wide open, though at f/1.2 there is a lot of violet fringing from axial colour. This has cleaned up by f/2, where the image is almost as sharp (very sharp) as it is going to get. When focussed on the centre, however mid frame, however, is a bit unsharp at infinity wide open, and still a little soft at f/2, cleaning up at f /2.8 and is excellent from f/4. 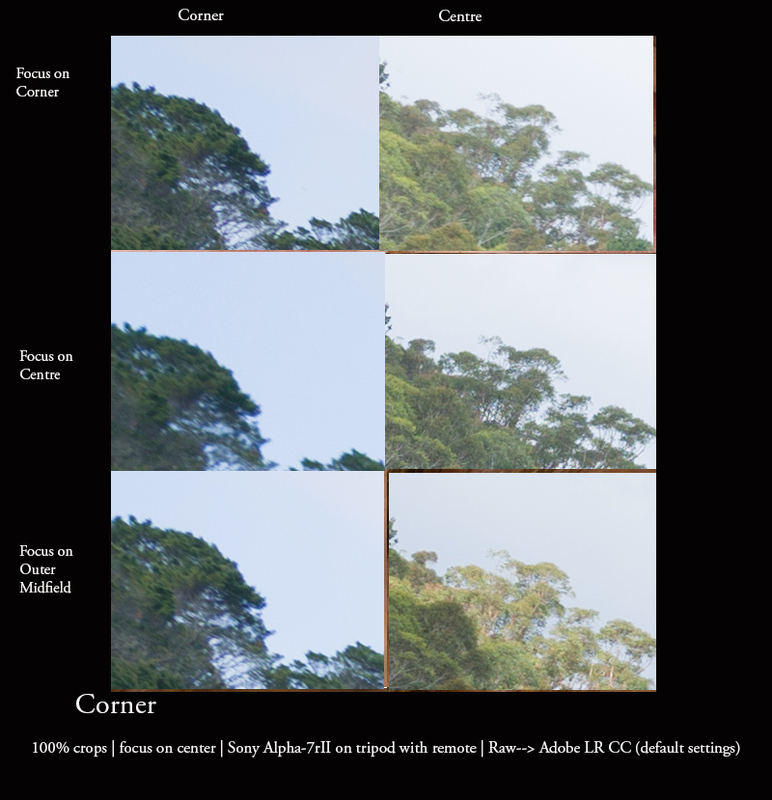 The corners, as we might expect, are very soft at f/1.2, pick up at f/2.8 and continue sharpening up until being usable for landscape at f/5.6 and fairly good by f/8. This is of course not quite the kind of performance we have seen from the Apo-Lanthar, but nor should we expect it from a lens of this speed and dimension. Overall the central and mid frame is outstanding stopped down a little, and the extreme corners are still decent. However the next set set of corps shows that excellent corner resolution is possible. As you can see, the difference is quite significant. The corners are best somewhere very close to the infinity hard stop. The centre is best backed a little off the hard stop. 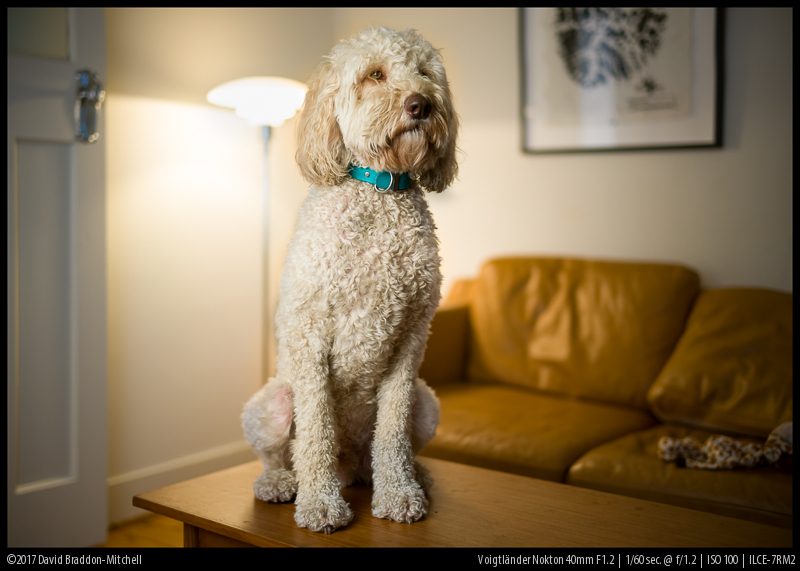 The exact positions may vary from copy to copy with the calibration of the focus ring, but in general the corners are at best focus a little behind the centre. Focussing for the corners produces actually quite good results across the frame except for the centre. Focussing one the mid field will give excellent results over the whole field. 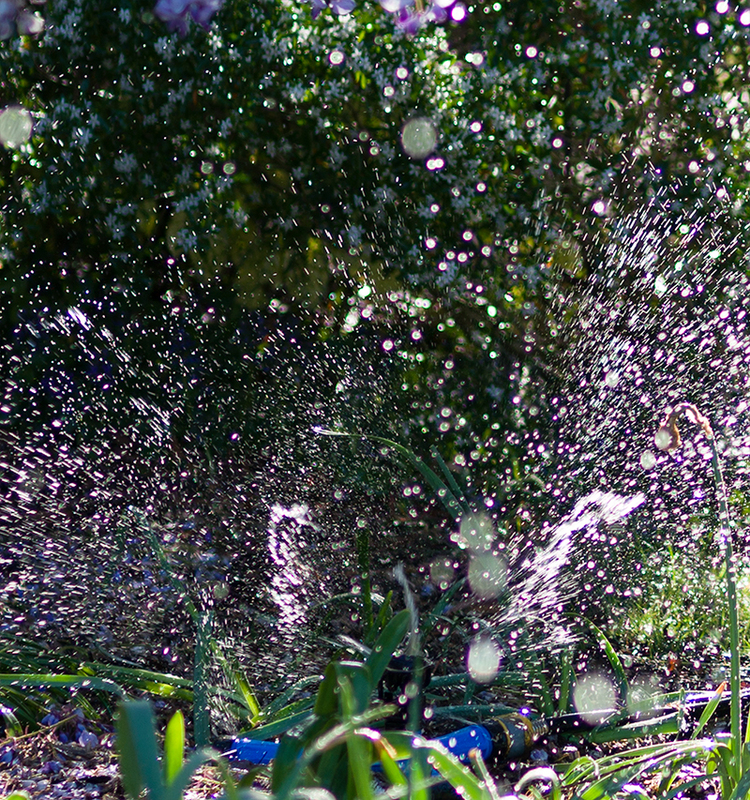 Here are some centre crops, which show that focussing on the corners gives a strong blur wide open in the centre, but this is almost gone by f8 as DOF gets deeper. 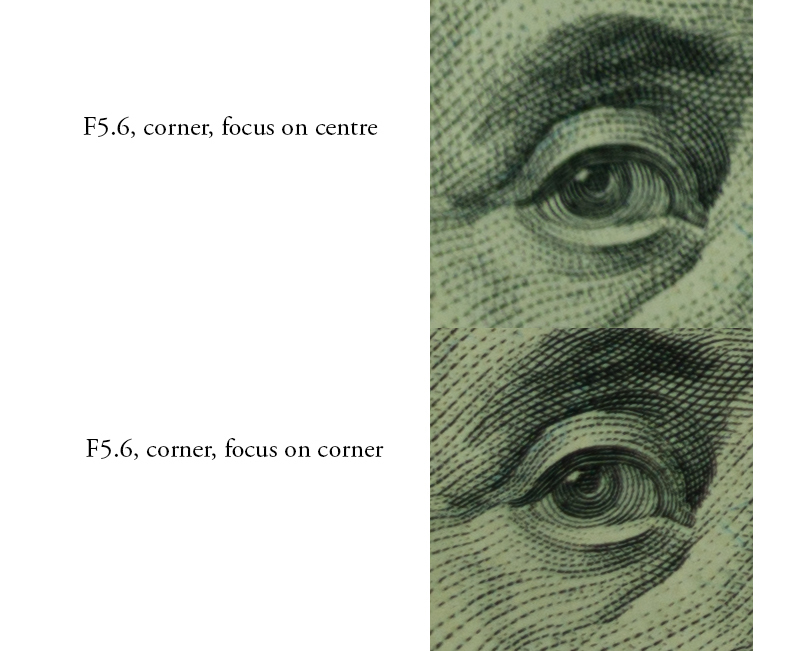 It is notable that the corner focus setting gives a better centre stopped down, than centre focus gives a good corner. So stopped down, corner focus gives a better overall result. 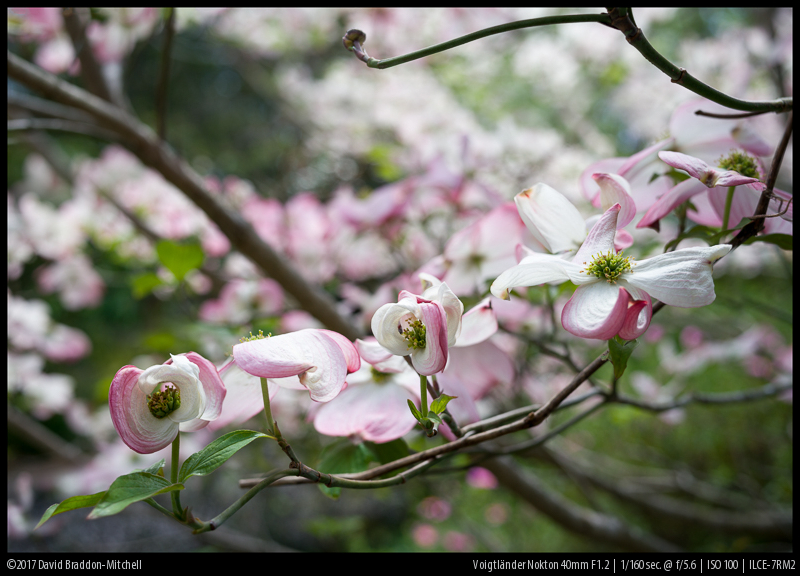 However at wider apertures, it seems that centre focus is better overall. A compromise focussing position will give you the best balance of sharpness across the frame. The next section will test whether there is such a compromise position. Now for a final piece of field curvature information: some crops of the corner and centre at f8 (where the curvature is already somewhat suppressed by DOF) focussed on the corner, outer midfield and centre. It shows that the midfield is a good compromise position. Not only is the midfield best when we focus on the outer midfield (obviously, which is why there is no crop) but while the corner is not quite as good as when focussed on the corner, it’s very good indeed when we focus on the outer midfield. The centre as well is, while not quite as good as the centre, also very good when we focus on the outer midfield. So the lens, with careful focussing, can produce very sharp results across the frame. These effects are visible at 100%, but are much less visible at 50%. So there is no need to panic. Especially if you have a 24MP sensor, where you probably don’t need to worry too much about where you focus at infinity. On my copy you can focus for excellent overall results at infinity by going to the hard stop, where you will get best corner results, and backing off the smallest amount possible, which will make the centre excellent without affecting the corners too much. These crops were shot at taking aperture. Fred Miranda, over at FM forums has found the same at infinity: it’s well worth reading his finding and seeing his crops, and I don’t see the need to repeat it here. The take home message is that this is a lens which needs ideally to be focussed at taking aperture. That’s a bit of a nuisance sometimes (as focussing wide open is easier, especially in low light). But it’s not that surprising or upsetting for a lens of this speed. Focussing at around f2.8 will actually get you most of the advantage of focussing at taking aperture if you are stopped down, and in dimmer light may well be the best option. A lens with these specification is surely in part an environmental portrait lens: otherwise the fastest apertures would be of little use, and certainly not worth the cost and weight. So how good a portrait can you take? 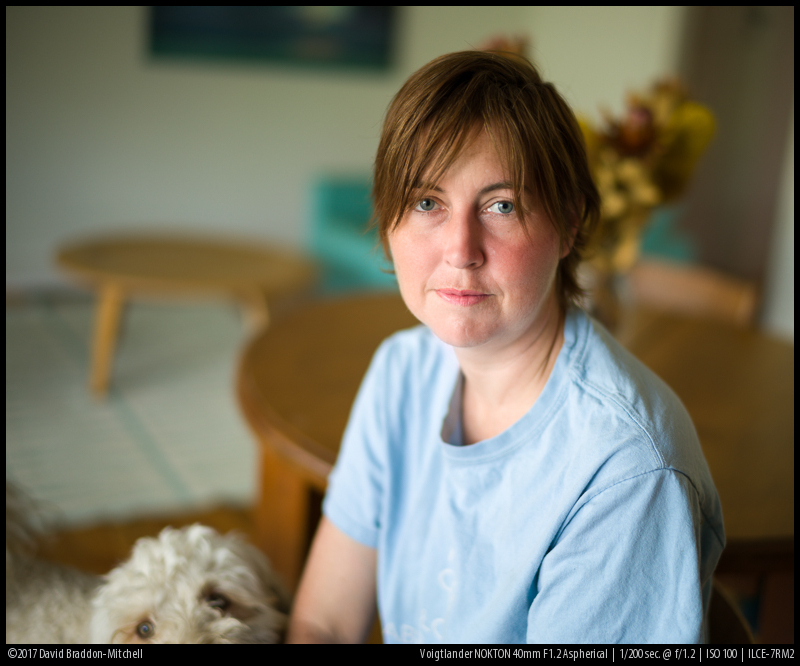 I decided to take a series of portrait shots at f/1.2 and f/2.0 – likely the key environmental portrait apertures for this lens. In each of them the eye is progressively further off axis. Starting with the centre, moving to off centre to the centre side of the rule of thirds corner, then to the midfield just beyond the rule of thirds corner, and finally the extreme corner. The extreme corner would of course only contain the eye of your subject in a very inventive composition! Centrally f/1.2 is fine, and off centre it’s pretty good too. I can imagine using the outer midfield as well. At f/2 the eye is excellent all the way to the outer midfield. A bit of sharpening improves this considerably. For those interested, f/1.7 is pretty close to f/2 in quality, f/1.4 not much better than f/1.2. Note: it looks as though the off centre f2 eye is a little less sharp than the outer midfield f2 eye. 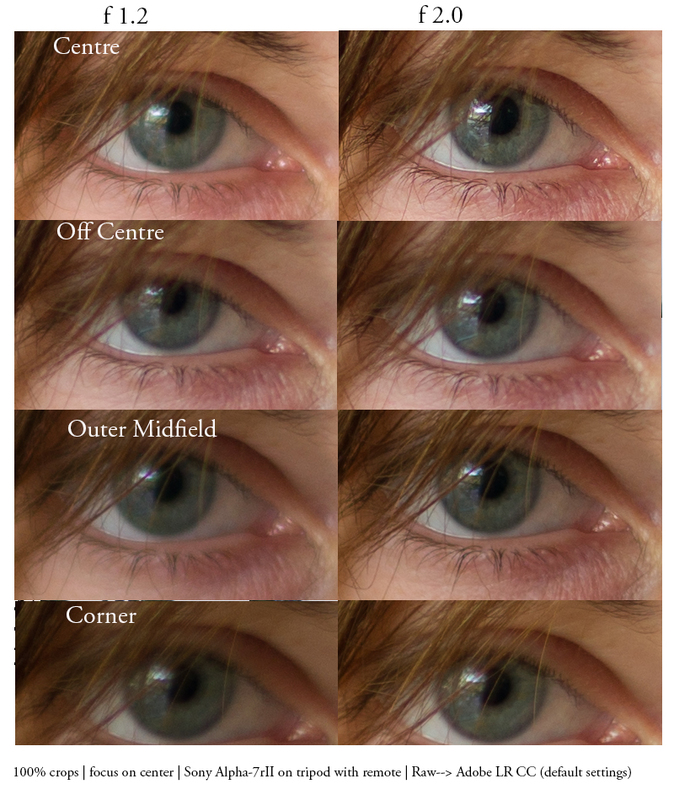 But this is a slight focussing error: looking more closely we can see that the iris has more detail in the off centre image at the expense of the lower eyelashes (which probably dominate the overall sense of sharpness) so it is focused a mm or so behind where the focus lies in the outer midfield image. So in reality it is a bit better than outer midfield, and really very good. Assessing bokeh is one of the most difficult things in a review. Some people give you crops of bokeh balls and elements of the OOF structure, but this in my view does not always give you a good idea of what the overall image is like. You can give aperture series, as I will here. But of course the look will vary a lot depending on the structures in the background, and on the distance from sensor to subject, and subject to background. Here’s another series; this time a bit closer: around half a metre, getting close to MFD. The background is about 2.5 metres from the large structure to the left, and infinity at the top of the frame. 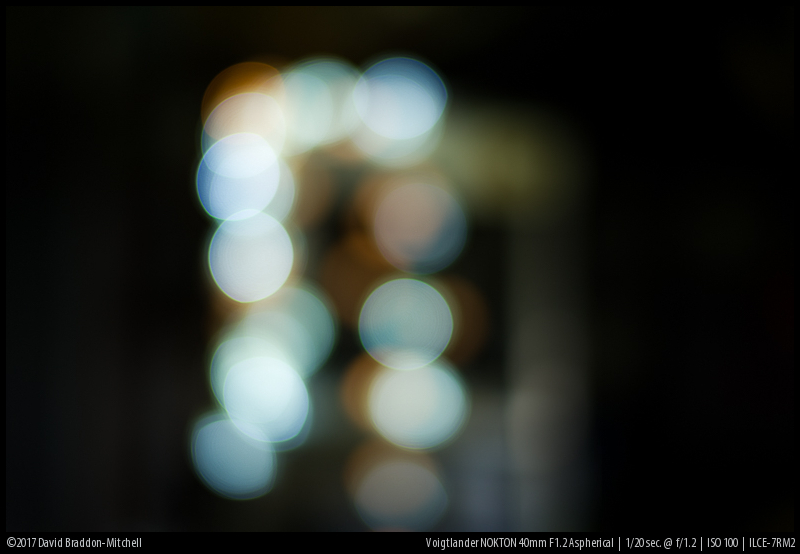 The character of bokeh balls are both important in their own right, as as a guide to how the overall bokeh may appear. I have here two aperture series; one with balls to the edge of frame, another with the balls central. So what do we learn from these two series? Mainly good things. First, although there are traces of onion rings, on the whole the balls are relatively free of onion ring artefacts for a lens with four aspherical surfaces (two elements). Not as good as the fancy smooth asphericals in a GM lens, but far from the worst I’ve seen. The crops above are not the very worst case scenario, but in fact they are more extreme than anything I’ve encountered in real world shooting. Second, the cats eye effect is largely gone by f2, and is not too bad for a lens of this speed wide open. As you stop down you can see the decagonal shape of the aperture, even from f2, but that is the price you pay for the straight blades that give you nice sunstars. I don’t find this very distracting. The closer you are to your subject, with many lenses, the smoother the bokeh. A real torture test is at around 3 metres: far enough away to be problematic, close enough for bokeh to still be a relevant criterion. 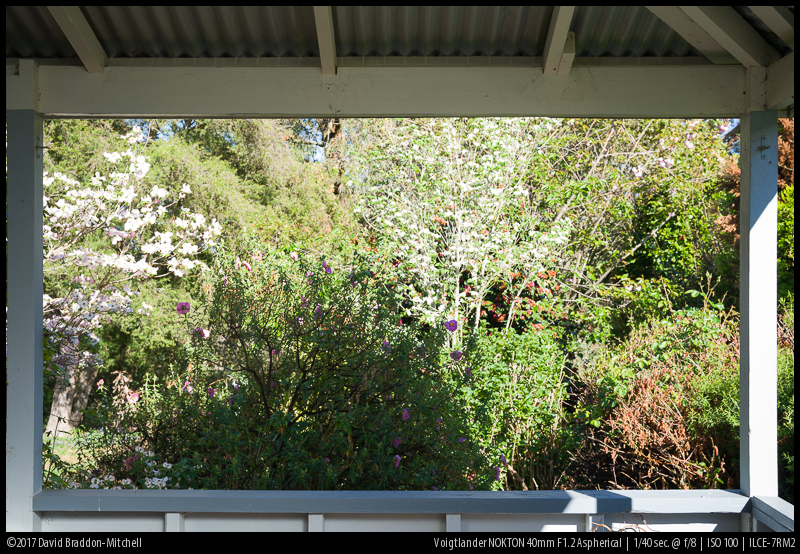 I devised an absolute torture test: the wooden frame around this outlook into a garden is at 3 metres. The plants in the garden are at varying distances, starting at just a few cm behind the frame, to many metres to infinity. There is a riot of stems, foliage and flowers. You couldn’t hope for worse! Overall I’m impressed. 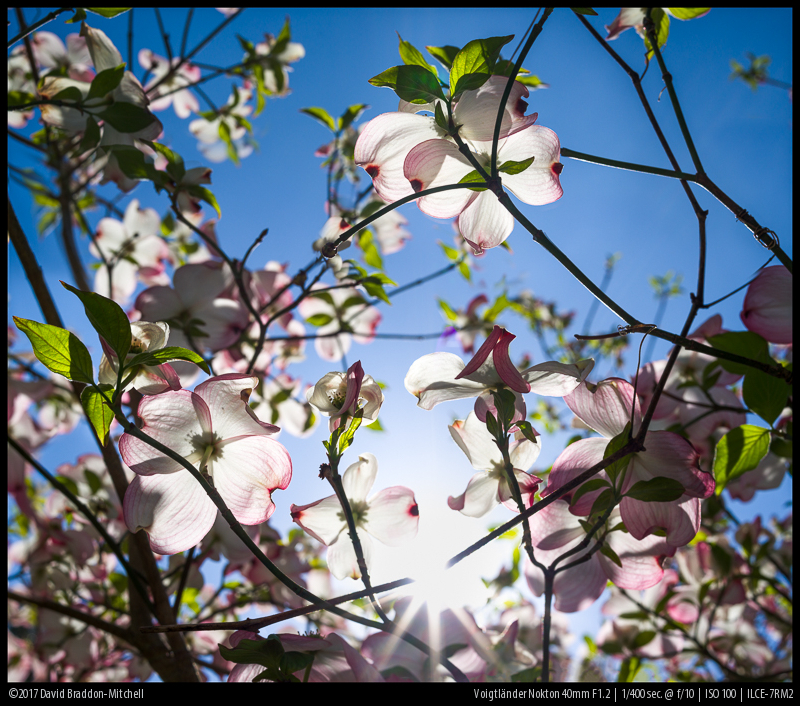 There are pronounced chromatic issues at wide apertures which you might want to correct. You can also see the reddy brown bush at bottom right some outlining and nervousness. This bush is just behind the focus plane and in he transition zone. It may also be subject to astigmatism (which I will test for separately). So unsurprisingly the worse case is subject at 2-4 metres, transition zone just behind subject. But many lenses produce *horrible* busyness in this kind of scene. Here’s another example of a similar scenario. Again the lens is focussed at 3 metres. The branches in the top left corner are 3-4 metres behind the plane of focus, in the area where astigmatism would affect them. The result is not too bad; relatively little nervousness. FC is not too bad here either: in the worse case because the corners come into focus fractionally behind the centre, the blur on the corners may be reduced if the corner detail is behind the central subject. Possibly this is slightly visible here, but it seems that the only danger case is when the background is just behind the subject plane. The sun here is almost entirely in the open, in the middle of the day which is the worst case for veiling flare and artefacts with sunstars. I moved the sun around to get the worst possible result. The only really noticeable artefact is the magenta tint to the right of the stars, and possible the “ghost” rays in the f11 image. There is a bit of light colour blobbing happening at wider apertures. You can also see some colour effects in ghost rays, and in the sample below, that I’m guessing are sensor reflections. They are not common on the A7rII but as on any digital camera they can happen. This is very impressive performance, better I think than the Loxia 35 or Loxia 50. Spherochromatism is another colour issue that the very best super-corrected lenses minimise. You see it two ways; a tendency for certain kinds of highlights to have a green outline, and to be filled in slightly magenta, or in areas of detail in the transitions zone to have a general green and magenta muddiness. The exceptional cleanness of the bokeh in for example the Apo-Lanthar 65 is down to perfectly white highlights lacking spherochromatism. This lens, as you could have gathered from the specs alone, is not entirely lacking spherochromatism. Having said that I have used much slower highly regarded lenses which are worse in this regard than the Nokton. I’m actually fairly impressed, given the specs. Finally here is a classic backlit water test (crop a bit closer than half life size: roughly equivalent to 1:1 on a 24MP sensor – this gives the most information in the pixel boundaries of the blog). There is strong axial CA and spherochromatism at f1.2; not much improvement at f1.6, notable improvement by f2 and good but not perfect at f2.8. I was about to test coma, when Fred Miranda did an excellent test over at his forums. It’s well worth clicking on the link and checking out his findings: they are very clear and I don’t think there is a need to replicate them here. 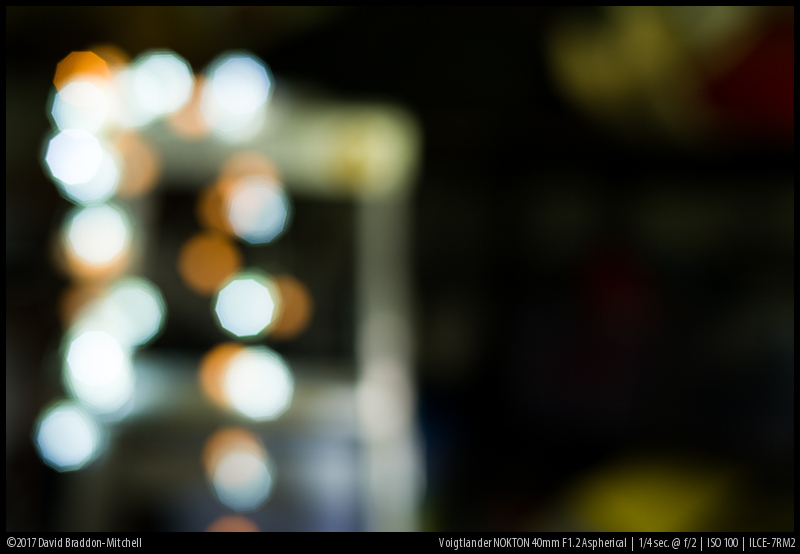 Spoiler: significant coma wide open, improving at f 1.7; and superb by f2.8. 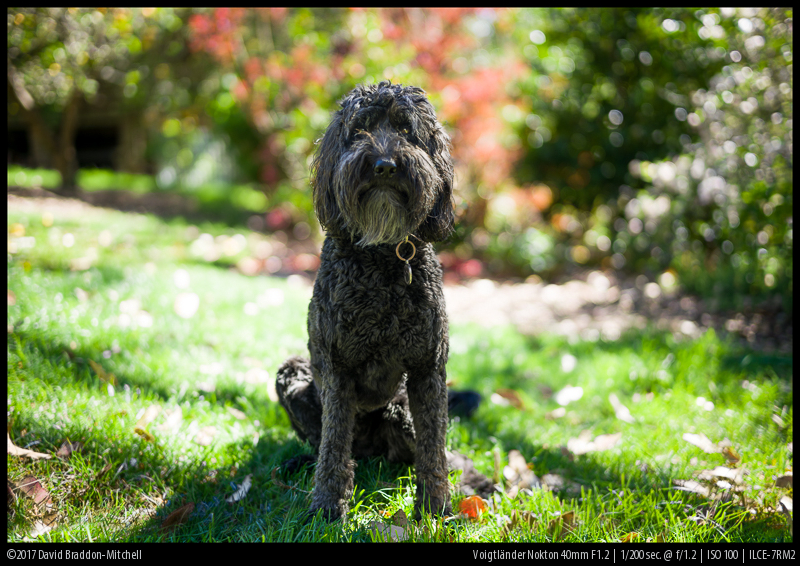 Vignetting is fairly severe wide open as you might expect and requires the LR vignetting slider to removed all to the right to fix it (though aesthetically you would rarely want to completely remove it). It becomes practically fine by mid apertures. 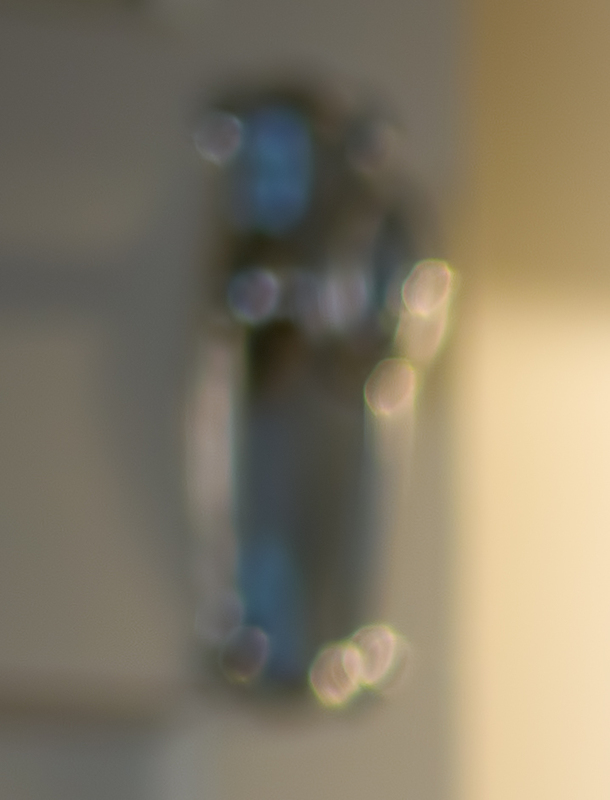 Here’s the vignetting in as close to whole stops from f1.2 as the aperture ring permits. In the centre at MFD the Voigtlander is not great but usable wide open, and becomes good by f2.8 (and improves a little more afterwards). I attach crops below. In the corners performance is much worse, partly due to field curvature. If you focus for the corners it becomes good (about like the f2 crop below) by f4. If you don’t focus for the corners, it’s never really crisp. I almost hesitated to write the above: someone will take is a black mark against the lens in an irrational way. But you are not going to use this lens to take pictures of very small pieces of planar artwork! That’s what scanners are for, or slightly longer lenses in galleries perhaps. What matters at MFD is likely central details surrounded by bokeh. And the lens performs reasonably well, albeit at low contrast, in this respect. 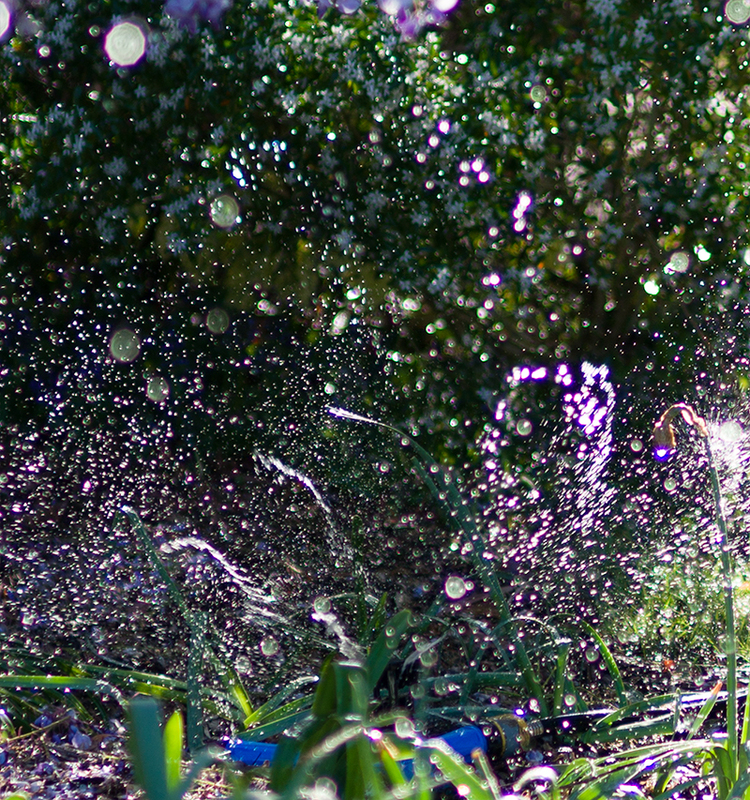 The three crops are f 1.2 (hazy but usably sharp – sharpening and contrast boost really help here). F2 (good) and f2.8 (very good). This is a slightly difficult section to write, as what counts as an alternative depends on what interests you about this lens in the first place. Are you looking for a 40mm? A fast 40mm? A fast normal, regardless of exact FL? A compact fast normal? I’ll divide this discussion up in that way. As always, I will discuss only lenses that I or the team know well enough, or have really good information about. So readers are bound to have favourites that we don’t mention just because we don’t have reliable information (just an example – there are a bunch of Leica lenses in this category). I also won’t mention lenses that I don’t think are sensible alternatives. There’s only one other; the M mount CV 1.4/40. It’s much worse on Sony in every way except size. If you want a fast 40 the Nokton 1.2/40 is it. Basically if money is not an issue, the current lens is the one to get against these alternatives. Otherwise the Canon and an adapter. This expends your search hugely. First AF lenses. The Zony 1.4/35, if you find a good copy, is great at the wider end. Sharper than the CV at wider apertures but of course much larger and 50% heavier. It’s also slower both in terms of f-stop, and even more in terms of blur potential. 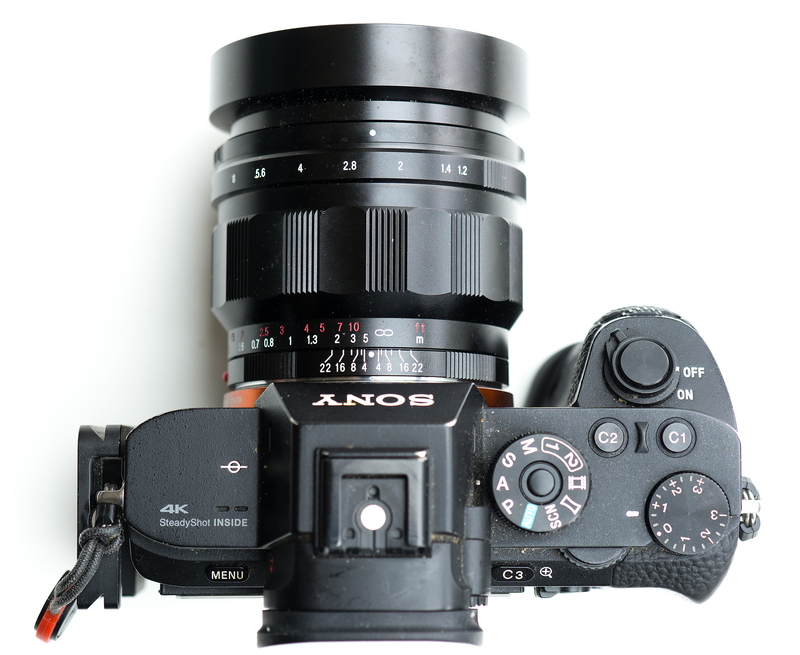 The Zony 1.4/50 is also optically a better lens, but again much bigger and more expensive: and not 40mm. Outside AF you can get adapt so many lenses that there’s little point trying to do a survey. I guess all I need to say is that you can get much better performance only at the price of size (Milvus 35, Milvus 50, Otus 50, Sigma Art 50 — though the bokeh of the last is not always to my taste). Considering this category made me realise what a good job Cosina have done here. This is likely the best compact fast normal. I don’t think the famous Leica 35 FLE is any better, and is hugely more expensive. 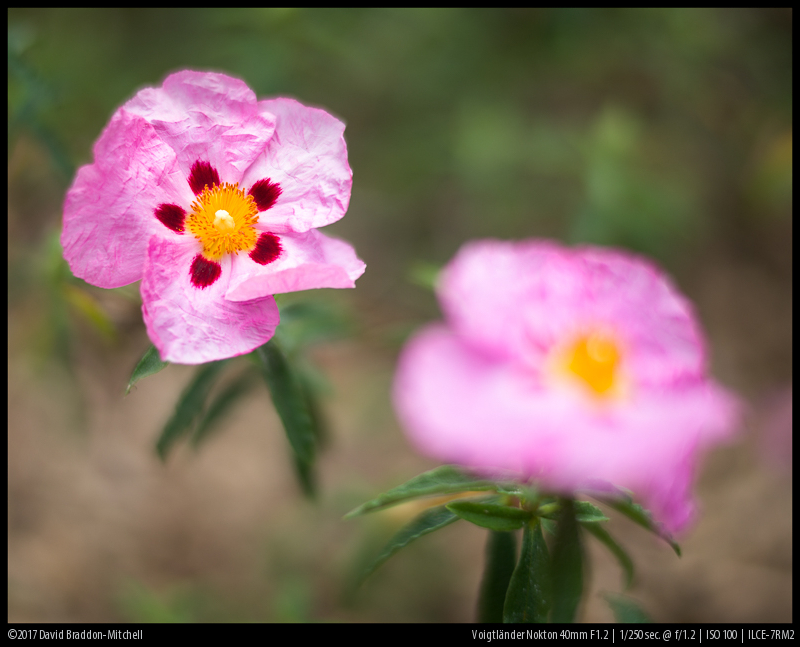 You might consider there Voigtländer 1.5/50, but it has considerably more field curvature due to the optical stack thickness it’s optimised for. A very good overall compromise might be the CV 1.7/35 Ultron, used with a correction filter (see here). It’s compact, sharp, and fairly fast though at f.17 might not really count as Officially Fast! The other obvious alternatives are principally classic fast fifties. They are cheaper (some of them not affected by collector price bloat) and can be great to use (Olympus 1.2/50, various Canons spring to mind). But they are not better; and the Voigtländer has much better contrast. For a long time now, I have been saying to anyone who would listen that the photo industry has become obsessed with small increments of resolution and correction, resulting in large and overpriced lenses. Instead, I have thought, we would be better off with some smaller slower lenses of high quality, and some balanced fast lenses: fast enough for some great bokeh, with some trade-offs to shrink their size and weight from Otus proportions. Looking at the chart of good bad and average, you might think there are number of reservations about this lens. But these are the result of some very careful trade-offs. This lens is a delicious balancing act. We have a super fast 40mm which is capable of good (better than classic f1.2) results in the centre wide open, and capable of critically sharp results stopped down. The trade-off is a bit of lateral colour, axial colour, field curvature and focus shift. 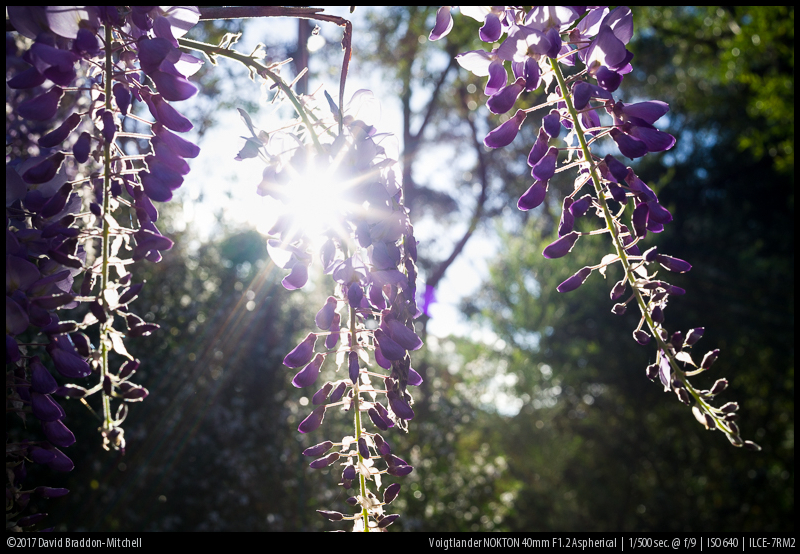 That’s what we should expect for a 420g f1.2 lens. And all those issues can be dealt with. LaCA is easily fixed with a checkbox in your RAW converter. The axial colour is largely gone by f2, which is impressive, and can be mitigated at wider apertures with the sliders in Lightroom (or C1). The field curvature can be dealt with by focussing at the outer midfield. The focus shift by focussing at taking aperture. Of course some folk were hoping for a lens like the Apo Lanthar 2/65, only 1.5 stops faster and half the size and weight! That was never going to happen. What we have here is a lens that performs better than the super fast classic lenses by quite a margin. It’s no Otus, nor even APO Lanthar, but it’s faster and smaller then either of them. And with a little care it can produce glorious results. The sensible compromises in this lens mean that you have to pay attention when focussing. But do this and you get sharp, contrasty images largely unaffected by backlight and with great sunstars at medium apertures, and bokeh which is good to glorious. So do I recommend it? Absolutely. If what you are looking for is a compact all in one lens that gives a wide-normal field of view, is very fast and has generally nice bokeh, as well as giving excellent landscape results if used with care, it’s not only entirely recommendable, it’s also pretty much the only game in town. You have to pay attention when using it, but it’s the kind of versatile, sensible lens that many of us have been hoping for for a long time. It may not be the best performer there is any one category, but if you want them all, it may be the best overall balance of compactness, speed, and IQ there is. So it’s very tempting for someone looking for thin DOF in a moderate wide-standard lens. In some ways it’s like a classic compact super fast fast lens. But it’s both a bit sharper, a bit less abberated, and has much more contrasty look than any of those classic lenses. And none of then is a 40mm. I love it: it has one of the most interesting sets of trade-offs I’ve seen in a while. I have to send my review copy back, but I’m counting the pennies to buy my own copy. Simply put it does things that no other lens I have does. If you want it, you can buy it from from our affiliate link at CameraQuest, B&H Photo Video or our link to eBay. Looks good. Maybe not perfect as the FE 55mm 1.8 but good enough. Can’t wait to see the rest of the review. Yep Bastian gives the correct formula. Roughly speaking (there is some simplification here) it’s the absolute aperture that determines blur potential. The absolute aperture is literally just the diameter of the max aperture. …aperure as seen from the front of the lens (i.e. entrance pupil), not the physical size of the aperture. Just to clarify. True, though the non-specular bokeh of this lens reminds me a bit of a different 1.5/50 – the c-Sonnar. And the cv is sharper than the c-Sonnar, so I suspect would still be more than competitive after the crop. I suggest to use a Fujinon 16/1.4 or 23/1.4. I achieved amazing results with those on a XT-1. yes, correct of course, but again as I said in the original text I was simplifying slightly. The differences between near and far of course matter more with longer lenses. What does the value stands for? Percent of the picture? Or is it just a value to compare (the higher the bokelicious the picture)? So these figures are only comparable through a unified crop range – because you can’t compare a 55/1.8 FE with an 56/1.2 XF (Fuji Crop), right? How do you manage to adress this crop factor? Which would mean that the background blur from the 56/1.2 (crop) is comparable to that of the 55/1.8 FE? The values stand for the size of the aperture in mm. It makes no sense to apply a crop factor. f.1.2 will be very good at 35mm and a bit better at 40mm, and certainly better at 50mm and 85mm, if the amount of bokeh is the onley of importance. But the focal length itself is in many cases more crucial, especially in more difficult environments such as indoors. 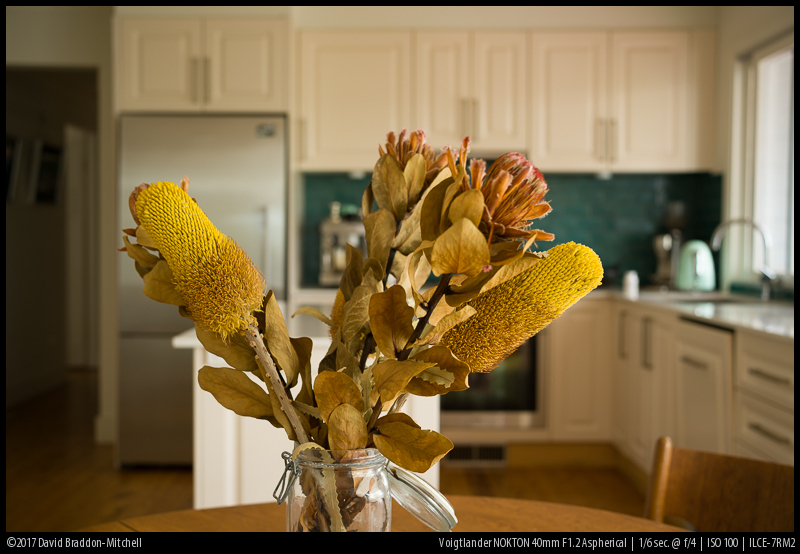 In addition, the smallest focus distance , is generally decreasing with shorter focal lengths, so I think 35mm f1.2 and 40mm f1.2 are very nice combinations of light emitting and focal length indoors. That’s *exactly* my take on this. 35-40mm is the focal length that *most benefits* from being very fast. Shorter lenses aren’t often used for images where blur is important. But the 35-40 lengths where you often do environmental portraits where you want to have some sense of the environment, but blur it enough to avoid distraction, really need the extra speed to overcome the intrinsically high DOF from moderately wide focal lengths. 40mm is probably a good focal length inside, when shooting family and friends. I use Voigtländer Nokton 35mm f1.2 Aspherical iii Leica m with Techart pro Leica m adapter to gain autofocus. I love that lens. I have now bought Sony Fe 35mm f1.4 to compare with, but for now the 35 1.2 is my favourite lens inside. Would love to hear from your comparison. I own voigt 35/1.2 II and I will get techart lm next week. Nick, I had the VM 35/1.2 II and it was one of my favourites…until I bought the FE 35/1.4. The Sony is much sharper, has minimal colour aberration and purple fringing, focuses fast with silent AF with great focus by wire implementation and also allows eye AF. It also focuses closer without having to fiddle with the close focus adapter in the case of the VM. It is also lighter than the 35/1.2 + CF adapter. Also I am not convinced about the VM build quality – i had the rear lens group come loose in the 35/1.2 and rattle around. It was fixed but seemed softer afterwards. I also had another copy of the 35/1.2 which was badly decentered. Similarly, the front housing came loose on my VM 50/1.1 and required service. This is with minimal use and very good care of equipment. Comparatively, i have had no issue with 7 sony lenses. I also may have been lucky but my FE 35 is sharp and well centered and required no exchanges. The only downside of the FE 35 to the 35/1.2 is the length, otherwise it is the better lens in my option. Especially now since prices are becoming similar. If you like the FE35 1.4 imagine what will be if you test the Sigma 35 Art 🙂 it is a lot sharper. +1 – I’m interested to hear all feedback on this setup! I’m about to buy an A7ii with a Techart Pro and the Voigtländer Nokton Aspherical II 35mm f1.2. Are you happy with this combo? The guys at Steve Huff say I should get the 40mm but I really like the character and FOV of the 35mm. Thanks for your feedback! If you like what you see, why go by other people’s preference? Indeed it does. I won’t be reviewing it. It’s a remake of the m mount version to account for the Sony sensor glass. It’s a ‘classic’ lens, for the lovers of aberrations. It does have an appealingly small form factor, but also one which even with modern tech can’t produce an even, sharp well corrected 1.4/35. Of course some people will love it for the look it gives..
Hi, I’m selling my 35 1.2 vii, I did compare it with the 40 classic 1.4 mc, and the cheaper 40 is much sharper in the center, it never reach it sharpness even at 5.6..you can say is my copy? maybe yes, but was the one I got, so is on ebay. Looking for this one now to update? my 40 classic. Would love the sony or samyang for it astonishing sharpness but there are bigger than my tamron 27-75 zoom lens. By the way, I use them with techart pro, eye af on sony a7iii. Great review. Looking forward to your findings on coma and astigmatism. So great to see this review. You’re probably the first English site doing this. I came across a review on a Chinese site but the nighttime backlit bokeh wasn’t that good, at least in those pictures. I also noticed that this lens has less aperture blades than the m mount version, that might make a difference too. Either way, I’m going to buy this or the m mount lens for my a7ii. There is no M-Mount version of the 40/1.2. Do you by chance mean the 40/1.4 or 35/1.2? Actually there is no M mount version. Hi sorry if I wasn’t clear. I meant the nokton 35/1.2 ii lens in M mount. That has 12 aperture blades whereas this e mount 40/1.2 has 10. Thanks again for all these pictures and this review. Look forward to more portraits and images with backlit bokeh. I mostly take environmental portraits of family so really interested in those. Hah.. seems Mahesh rode a time machine. A 40mm 1.2 M-mount was indeed released 2 months after this discussion 🙂 It is $200 cheaper than the e mount and even smaller! So was wondering E-Mount vs M-Mount with tech art adapter. There should be some difference in the optics as form factor is different. I will look forward in case you review the M mount one against this E mount. No we don’t plan to review it as none of us has an M camera. Those I most trust on the web show that it performs a little worse with more FC when used on Sony than the native one, suggesting that the two models are indeed tweaked for their respective sensor cover optical thicknesses. The size difference largely goes away when you add an adapter. If you have an M camera as well as a Sony, and like the idea of AF, I can see the attraction of the M version, if you don’t care about FC too much. But I must admit that I no longer use my techart. It’s a nice idea, but manual focus works better than Techart which is a bit flakey off centre. And if I am using AF it’s almost *never* with the centre AF point. Thanks much for the detailed view. Appreciate it! Thank you posting this review, and I am looking forward to the next parts. A few years ago I stupidly passed up a chance to get a used CV35 F1.2 at a great price, and when this lens was announced, I started think of it as a chance to make up for that mistake. Oh wow hard choice! It would depend on what other lenses I already had, and what I wanted to do. Neither the 50 or 35 Loxia will give you the lovely wide aperture rendering of this lens, whose bokeh is about equivalent to about a 1.4/50. So if I were looking for a thin depth of field normal-wide I’d choose this for sure. 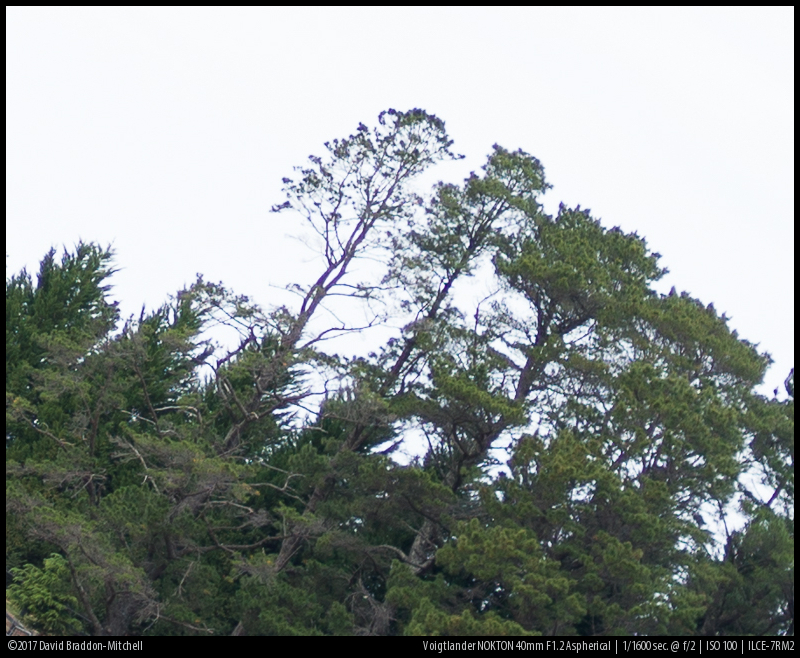 But if I wanted a stopped down landscape lens, I’d go for whichever of the Loxias was my preferred FL for landscape. If I wanted a portrait lens, it’d be between this and the Loxia (or a longer one) depending on the kind of portraiture. Thank you for your opinion. I currently own the Loxia 50 and 21. This seems like it can be a lot of fun. 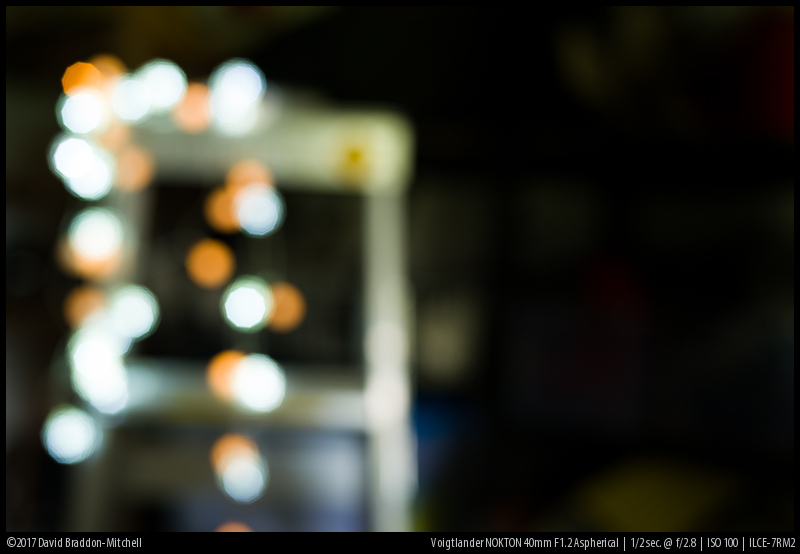 But for f1.2 and f1.4 bokeh did not see the difference, can you test it again? That’s because f1.2 is not massively different to f1.4. 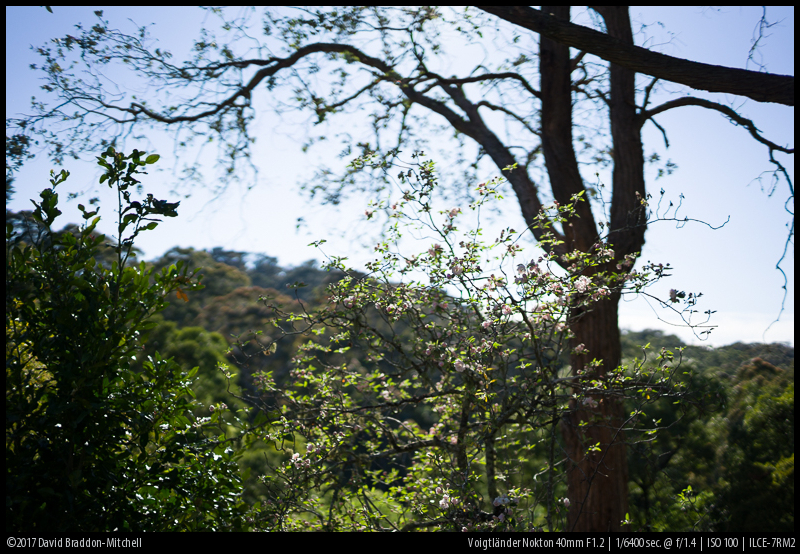 In the blog-sized images here the main difference you can see is vignetting. 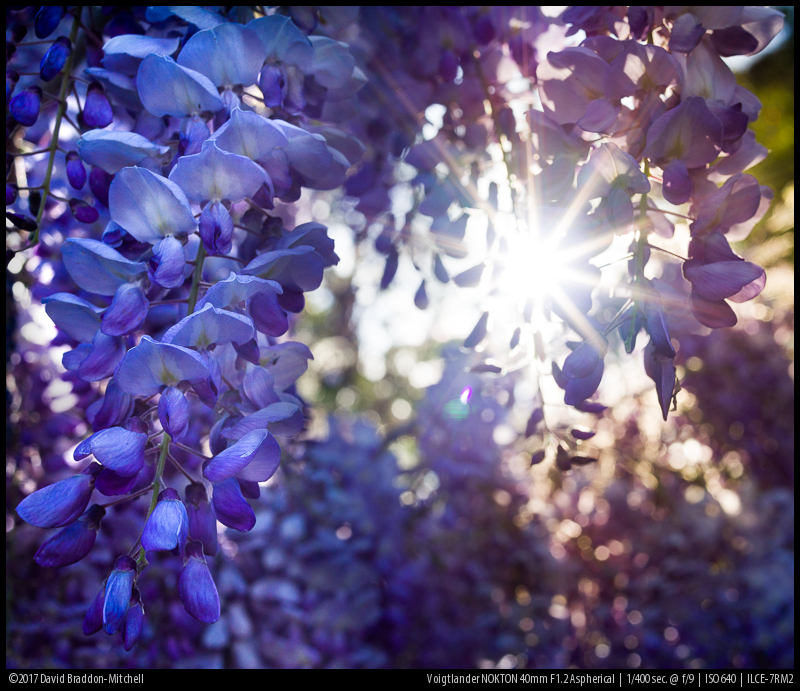 But there is a clear bokeh difference viewing the image at sizes equivalent to an A2 print. In case you are worried, the f-numbers in the footers of the images come direct from EXIF, so there’s no danger they are mislabelled. Looks like there are quite a lot of aberrations – for this performance the lens is way overpriced! for $500-$600 it would be more convincing. Unless minimizing size is critical, i think a higher performing and more practical lens would be a native sony FE option like the 35/1.4 or 55/1.8. The cost, weight and blur potential would be similar, but optical quality and usability much higher. 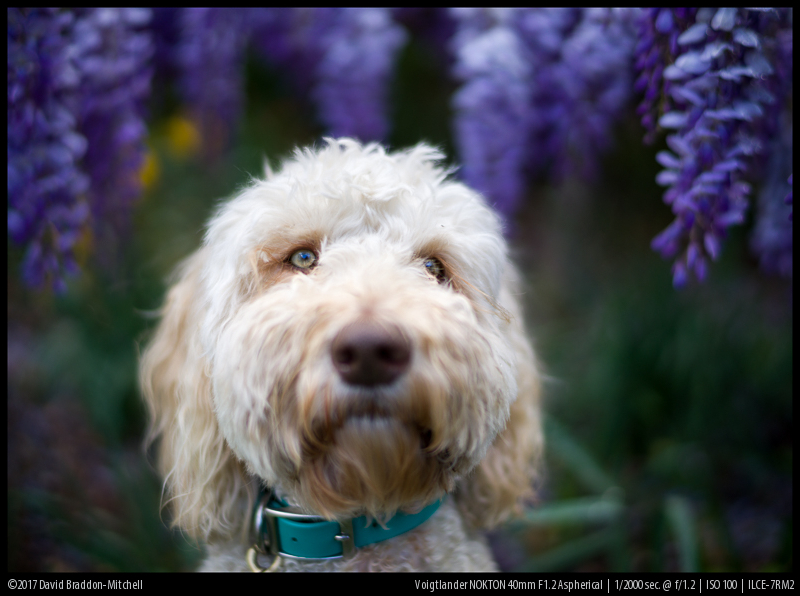 The new Voigtlander prices are ridiculous. The 35/1.4 is quite a bit heavier, bigger and also even more expensive, in addition to the differences between a 35/1.4 and 40/1.2. 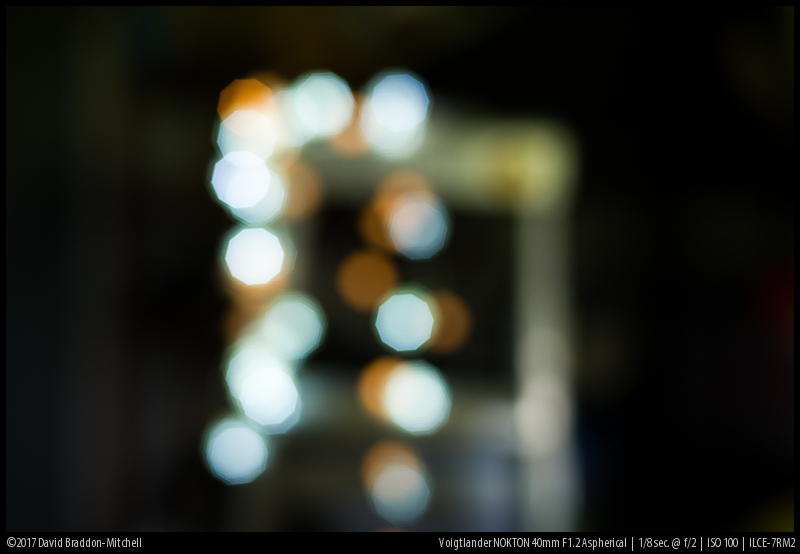 The 55/1.8 again boasts quite a different focal length. I don’t think anyone is going to make a mainstream decently sharp f1.2 lens for under a thousand dollars ever again.. I think under $1k for a simple design like the 40/1.2 should easily be achieved. Sigma is producing much more complex lenses for less (most of the Art prime series is under $1k). Similarly with Samyang and the range of Chinese manual lens manufacturers e.g. Mitakon 50/0.95. The 40/1.2 should cost max $600-700 for this kind of performance. Yes the VM is a niche lens that does not benefit as much from economies of scale like Sigma, but also their lens would be simpler to manufacture. Although we know you love the FE 35/1.4, perhaps we can now focus on characteristics and experiences with the CV 40/1.2 again, thanks. I’m sorry Robert I didn’t’ realise you did not allow any criticism of your lenses of interest to be posted here on Phillip’s site. Your advice about my career options is much more useful in this discussion then some technical comments. I won’t argue about what counts as a “bit” better; but one thing to bear in mind wiht the FE 1.4/35 and similar AF lenses is that designs like this 1.2/40 would be almost impossible to make with effective autofocus: all the elements are large, and in any case the overall lens is designed to unit focus. It adds considerably complexity and size to design a lens where there is a very small light group that can be moved for focus, which is what is needed for decent AF. So not all the extra size, weight and complexity of the 1.4/35 goes towards IQ. If it is not for you than that’s fine. We heard from you the first time. Move on! I have the FE 35/1.4 and although it is great it never comes with me out and about. Just to big. The 55/1.8 again great, but alittle to long as a walk around sometimes. This lens will fit a lot of peoples needs as a versatile walk around lens. Which means more use. Which translates to better value. I would say the price is right. To each there own. What the characteristics of the lens and versatility suddenly are better at 600-700? Since this lens does have a chip with lens data, does the ca get corrected in camera when shooting Jpeg ? Yes, there is lateral CA correction when shooting JPEG (and RAW too if you use lightroom or C1, both of which auto correct according to the information the camera sends them). If you like the Nokton 1.4, then this lens really is for you! It’s sharper and better in ever respect, and a bit faster too, and if anything the bokeh is better controlled as well as being a bit more of it. And while it’s a bit bigger than the 1.4, even with adapter, it’s still impressively small. Enjoy! That is interesting. Is this an auto thing or can it be turned off? 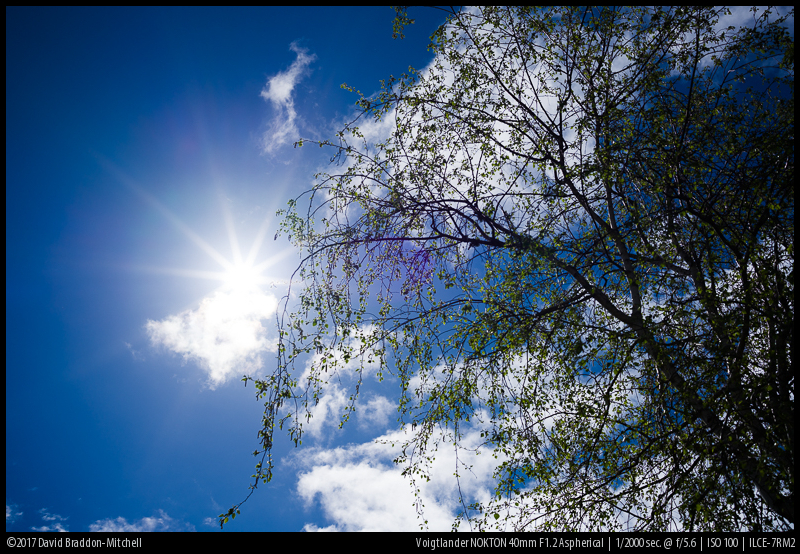 In the case of RAW (and probably JPEG too but I haven’t checked) the CA correction CANNOT be turned off in LR or C1, but the vignetting correction CAN be turned off. This is because an auto-profile that is in the metadata of the file is applied. This is not the same as the profile that Adobe itself creates for lenses, and which can be applied or not at will. If you use a “dumb” Raw converter that doesn’t act on this metadata you can bypass the auto-profile (RPP for instance). But LaCA correction is harmless and pretty lossless, so why would you bother? 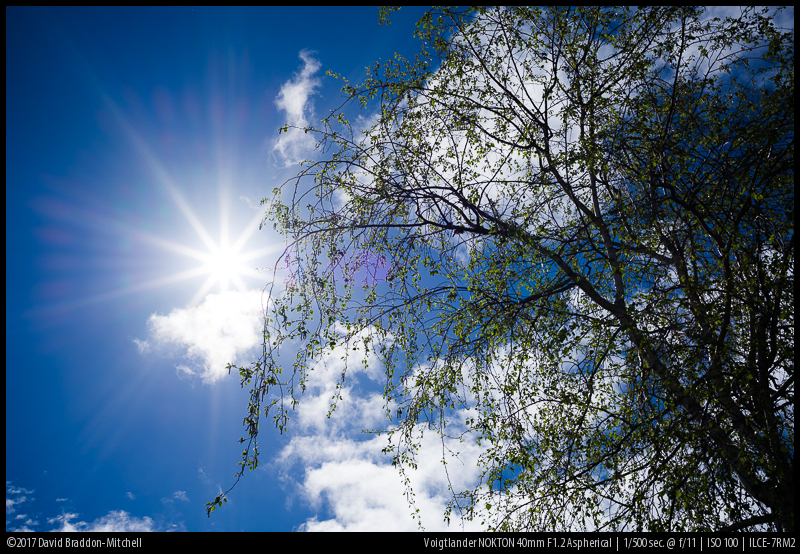 It’s good that vignetting correction can be turned off though, and in my view you always should. It raises the noise in the corners, and if you want vignetting correction, better to do it yourself (reversibly) in post to the exact degree you want. Don’t mean to rain on the celebrated Voigtlander brand parade, but I’m not impressed, especially based on its price tag. This lens deserved more development to get past an average performance. Making an f1.2 lens is no small task. Settling as even an f2 model, it would still need better bokeh, much better corners and just a wider range of usable apertures. There is a use case from which I can see you may not want this lens; but I don’t think more development would likely have helped. It’s a pretty compelling set of compromises between size, speed and performance. I doubt if any one of those could be improved without impacting on one of the others significantly (unless perhaps for much more money). 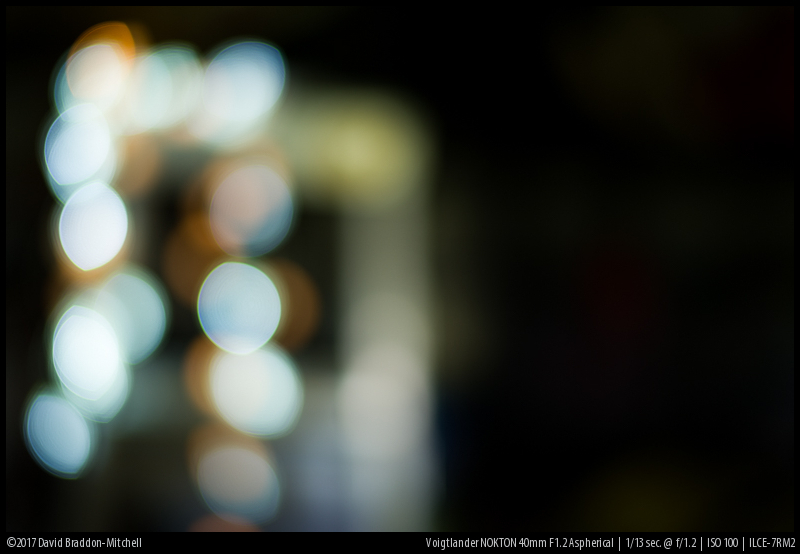 And the bokeh is really surprisingly impressive: I expected much more funk. Hi, was just wondering how this compares to the 50f1.5 Voigtlander? I am expecting the Bokeh to be slightly similar given that the 40 mm is wider but any other improvement in terms of the optics? I still have and use the 50mm 1.5. It is also plagued by severe field curvature issues because it wasn’t designed for the Sony E-mount filterstack. 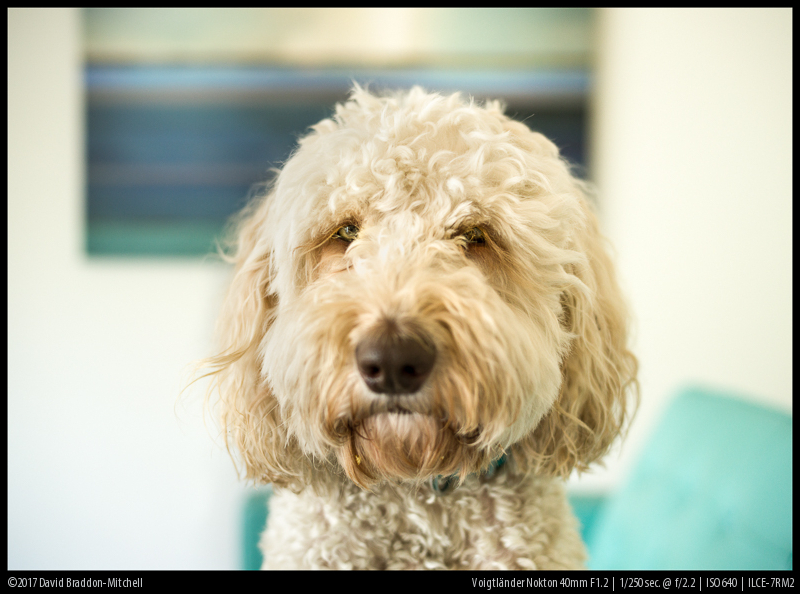 I think the 40mm 1.2 has somewhat softer bokeh, but I say this without having compared both side by side. It would be nice to see how much field curvature there is on other A7-bodies as the optical stacks on the sensors vary somewhat from model to model. Do you have any proof for that claim? The changes in AA filters alone means that there will be differences. I’m not saying the differences are massive, but enough to cause some difference in for example field curvature. That lensrentals article does not give any evidence that there is a difference between the different a7 series cameras or the a9. I don’t have a good source which disproves your claim but as Bastian mentioned this would affect the performance of native lenses and I think I would have heard about it. The real thickness might vary, but to my knowledge the “optical thickness” is the same. It also better should be, because otherwise lenses like Loxia 21mm 2.8 or Sony 12-24mm would show significantly different results on different bodys. Which they don’t. and tapping the shutter release brings back full view, no need to mess with buttons or joy sticks! I’m afraid I have to part company with you on the question of field curvature.Yes the extreme corners are soft but the imaging on the rest of the frame (with my copy) is flat as a pancake. I’m very happy with my lens. I’m not sure whether you are disagreeing with my results, or not. That is of course constant with being able to get sharp results across most of the frame focussing on the centre. Auto magnification is not a unique function of this lens. You can thank Sony for that feature. Naturally! There would be no way a lens maker could implement that unless it were there in the body to be turned on! People vary in how useful they find it. Personally, I find it useless. I like to choose my area and then press and assigned button for magnification. Interesting alternative. Costs less, but is even slightly bigger and you have to crop each picture unless you accept very dark edges. Also nice rendering though. Which of there flickr pictures are cropped? Crazy field curvature – the photo of the playground equipment, for example. I find the bokeh on the Samyang very busy and distracting, esp vs the CV, and agree with comments about the need to crop. Great review Thanks a lot for your work! It is an very interesting lens. As alternative i can recommend the Voigtländer Ultron 40mm F2 SLII with Nikon mount, wonderful on A7 Body´s, very good corner performance, very sharp from F2. Another great, comprehensive review! How would you compare this with the Zeiss 35/1.4 ZM adapted to the Sony A7RII? The Zeiss is great with the Techart Pro adapter with some flexibility with AF. However, I’m thinking of selling that in favor of this native mount lens as I prefer native mount, and to me 40 is close enough to 35 as a FL. My hunch would be if you prefer 40 get 40; if you prefer 35 stay where you are. The wide open bokeh in many circumstances on the 40 is wonderful though, so if that’s the kind of image you take a lot of, that might well lean towards the CV. I think (but I can’t guarantee since I haven’t done direct comparisons) that the wide open (or indeed f1.4) resolution of the Zeiss is higher. Thank you, David, for your great work and deep review. I have another comparison question for you. How about this vs the OM 50 1.2 that you reviewed so well here? Obvious differences would be flare (CV none vs OM easy to flare). OM less field curvature? Both lenses pretty weak corners until stopping down. OM rather unpredictable bokeh wide open. I’ve been rather lusting after the OM 50 1.2 since your review, but this CV I don’t think is going to nudge the CV 35 1.7 out of my bag. I like both modern Voigtlander lenses and old OM (I’ve had both in my bag in the last days) but for different reasons. The CV has great corners if you focus for them, and pretty good ones if you focus in the outer midfield. I didn’t specifically test the OM for field curvature; it’s possible that it too would have better corners if they were focussed for. The cv has somewhat better resolution at wide apertures (except perhaps at MFD where the OM might be ahead. The flare difference is massive. My guess is that the Ultron 35 is sharper at the equivalent wider apertures, but it’s always hard to know for sure without direct comparisons, rather than looking at distinct reviews. I think Fred Miranda is planning to compare the 40 directly with the Ultron on his forum site..
Looks good to me. I agree with you that some of the commenters are being a bit unrealistic about its performance. You aren’t going to design a small, fast and perfectly corrected lens for a reasonable price, compromises will always have to be made. The 65mm F2 macro would pair well with this lens. Do you have any experience with the Mitakon 35mm .95. I have been looking for a fast, small lens. Curious how the Mitakon which has good reviews might compare. Would be using that on an a6500 or if I purchased this lens it would be on an A7rii. Any thoughts would be appreciated. I haven’t used the Mitakon 0.95/35 but as far as I understand it only covers the APS image circle/ So it’s a full frame 1.4/50 equivalent for thereabouts. If it were me I’d just get a full frame 1.4/50 and be done with it unless I was independently committed to APS for size or cost reasons. The thing about the CV 40 is that there is nothing else with this combination of FL and speed. On APS would need something like a 27mm f0.8; and that aint gonna happen, and certainly not with comparable quality. Thanks for reply. Yes the Mitakon is just for crop. The attractive part about it is the small fast form factor, which is really the setup I am looking for a walk around manual focus lens. The 1.4 50 is way to large for me as a general walk around lens. That size and speed of the CV 40 was attractive. Even though different sensor sizes the Mitakon appears it might give me the same look based on reviews in a smaller cheaper form factor. That is why I was wondering if Phillip had any experience with the Mitakon to shed some light on the comparison between the two. I have no experience with it either. Your optimism over this Voigtlander is getting harder to believe. Looking at your own photos, this lens does not provide acceptable full frame optical performance until stopped down, not uncommon for many lenses of this speed. These misgivings are not compromises – they are optical results which an informed shooter would consider with any choice. Of course it doesn’t provide good results across the field until stopped down. As the crops show, and as I said! 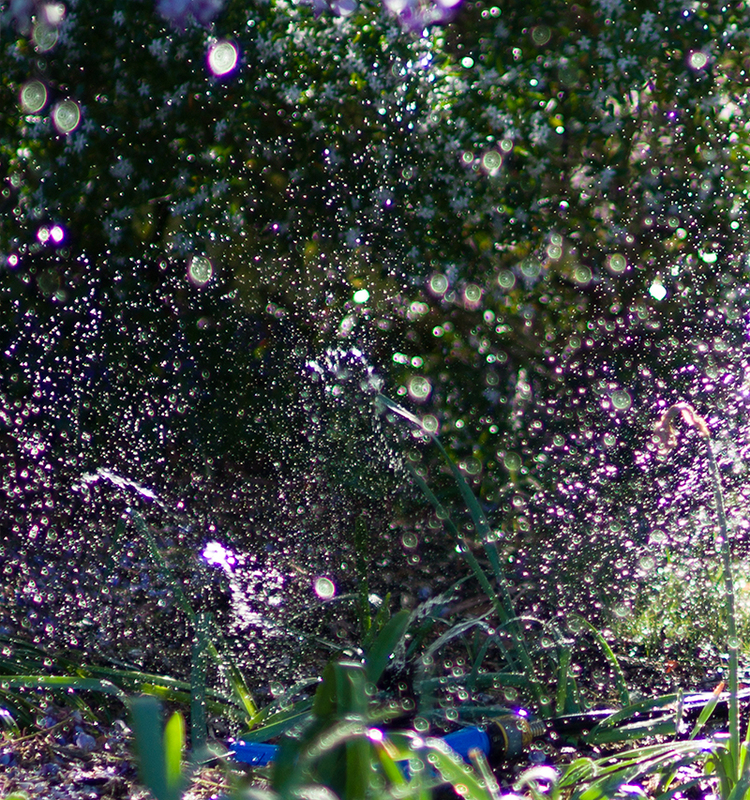 If you want this speed and and you want it sharp across the field at wider apertures you will need a much larger lens. But for many purposes some of us find the bokeh at wide aperture very attractive and the central subject sharpness acceptable. Even if your counterpart didn’t. The compromise (if there is one in real-life shooting – who wants sharp corners wide open for goodness sake!) is between a reasonably sized lens and a bazooka, like the Sigmas and Otuses. If you cannot see that, and it seems you don’t understand it, then just be happy with your bazooka. Great review. 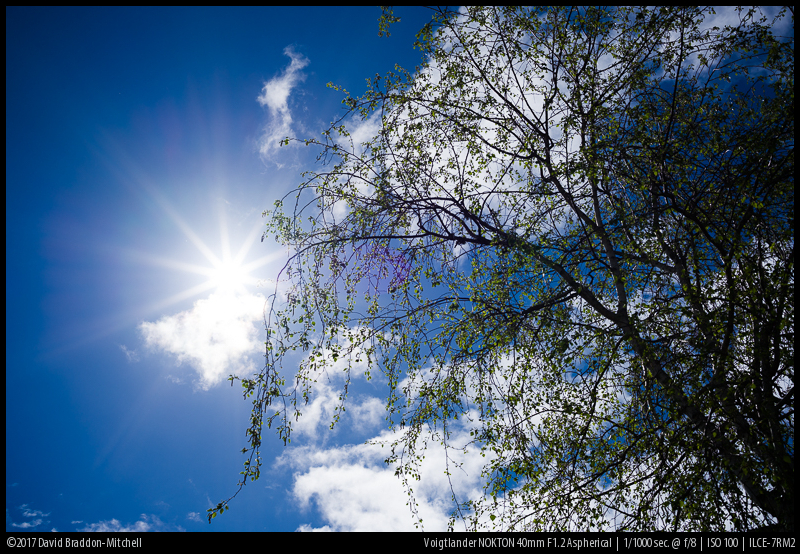 Does it have open-aperture metering on the a9? IE, will it stop down automatically when you take the photo? Thank you for all the hard work you have done here David! I know how tedious it is to prepare images in a way making it possible for readers to understand. I have now started to look for a S/H A7RMkII so I canm get a camera for the lens…! Thanks Jonas; it’s great that the work has helped and really great to hear that from someone who understands just how much work is involved it doing this well..
Congrats for the outstanding work. This is probably the most comprehensive and usefull review of any lense I have seen on the net. Cheers and thanks to all the team contributing to this unique blog ! Thanks so much. It’s a real pleasure to hear that it’s been helpful. Very nice review. Thka a lot! But if i see the bokeh sample im sad that they didnt made a 2.0 lens with half tha size since the bokeh differences are not soooo big. Well you can see the difference, and personally I think it’s worth the extra size and weight for the blur. But I can also understand that some might prefer an f2 pancake.. Surprised you haven’t included the Konica Hexanon 40mm f/1.8 in your list of alternatives. It’s a great piece of glass, very sharp, beautiful colours, small and light. Yes I’ve heard good things about it, but we don’t include things by reputation alone: they need to be things that we have used or reviewed ourselves, or where trusted people whose work we know well have tested it. Obviously there’s lots of other great stuff out there, some of which have great reputations. But we have been let down by great reputations many times, so while a great reputations is some evidence that something is good, we are trying to provide *extra* evidence, over and above that. Having said that, the Hexanon (especially for it’s price) is something one of us should review…. I was about to write the same. I own the Hexanon, and I find it to be a great lens, specially if you bear in mind how inexpensive it is. I used to own one but I found the f/1.8 performance to be pretty poor so I sold it. Stopped down it was excellent. Trying to figure out where this guy would fit in my bag. 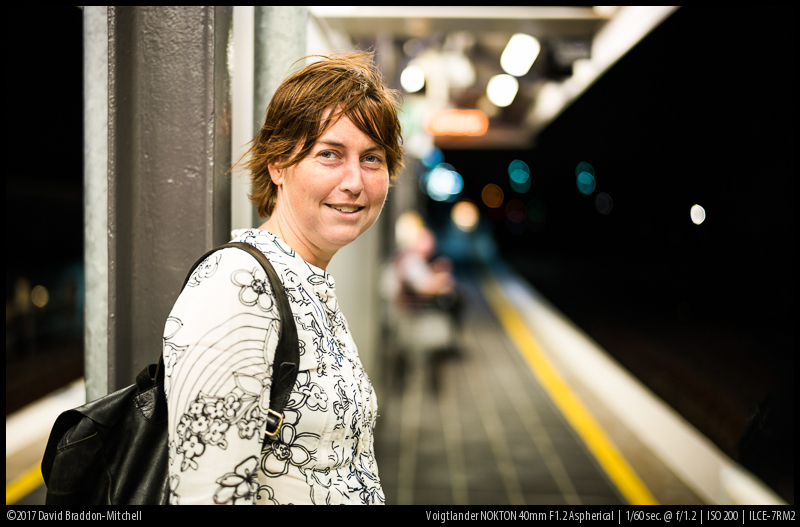 I’m quite happy with the new 35mm 1.7 but would like the exif data and really…that’s about it. The beefier knurled focusing ring looks nice and I had the 17.5 for M43 but the funky 35’s focusing ring isn’t bad either. Hmm, how much is that exif data worth it to me? 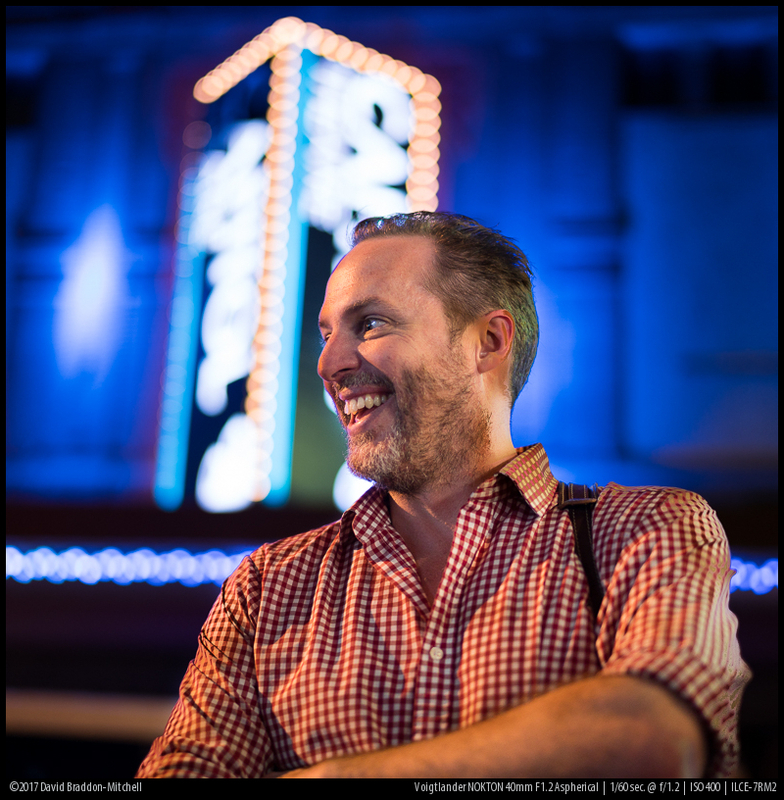 Can’t say but I will say for anyone still considering the 35mm 1.7 over this. I never did the pcx filter mod and oddly enough it hasn’t been an issue. It’s surprising good wide open as well. I tend to shoot people with it mid or slightly off center frame. At f8 it’s all good anyway if you need the corners to get inline. Man, so many good lenses released this year. I get the VM mount version on Friday, to say I’m excited is an understatement! With no internal floating elements I should be able to get well focused images at f1.2 with the my autofocus adapter. David, or anyone else who might know, do you think that a PCX front filter or the Kolari UT mod would fix the field curvature and astigmatism prombelms on the CV 40 1.2? Similar to how it does on the CV 35 1.7. My guess is the Kolari mod would make it worse – I think but am not sure this lens is optimized for the thicker Sony sensor stack. I also doubt that a front filter would help, unless perhaps an aspherical one, because of the shape of the curve. Great review, Thank You for Your excellent site, all Your work ! Don’t You think the focus-throw is ridiculously, unpardonably short (particularly for such a fast lens) just there where it matters most (-to me -but excellent from minimum distance up to around 1m) : namely from 1m to 5m it’s about 2cm only ! So; a portrait at distance between 1.3m and 2m (huge70cm play !) translates into.. guess how much turn on this lens (remember you try to focus on one eye with aperture 1.2, 1.4, 1.7, 2..) ? : 5mm !!! It’s than down to not even a matter of a 1mm rotation on Your lens and You are already off and supposed to focus back, but not past..
At that point its not anymore a question of having a good eye and trained reactivity, but luck on top of it. Let’s focus by moving the camera ? lol. I like this lens a lot though, just like the 65mm that unfortunately (also totally unpardonably to me -especially for filming witch I do not) lacks the excellent stop-less aperture-ring option I permanently leave on “smooth” on the 40mm. Thank you David for this review. I was thinking of buying a VM 40 1.2. But after reading your review, I have bought myself an EF 40mm STM and I am absolutely pleased with it. 40mm is something that I have missed in 30 Years of photography. I don’t like 35mm much. I think it’s a rather boring wide-angle. 40mm is different, it has no wide-angle characteristics any more, but it’s still a bit wide. It’s the standard lens, that I have missed all those years. The EF 40mm is perfect at 2.8 on my A7r. 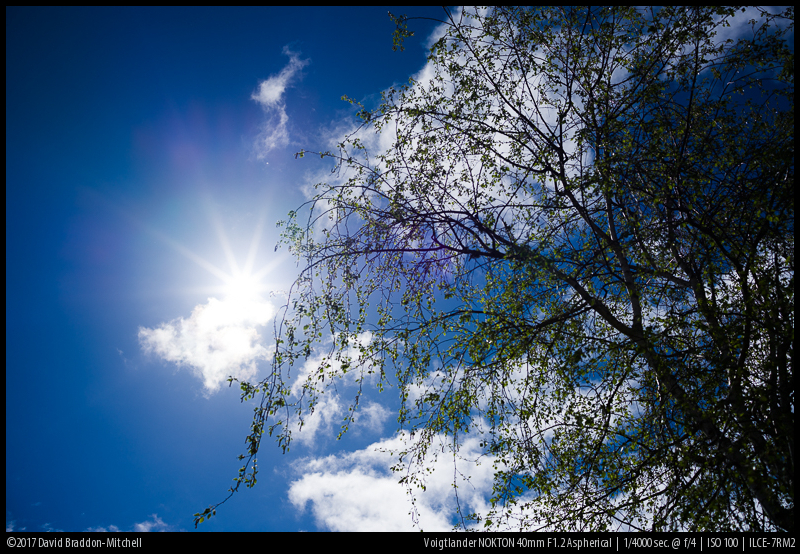 I like the vignetting very much . It’s very smooth and in the sky it looks a bit like a polarizer. Here are some Samples from a 2-days trip to Venice, three weeks ago: https://www.davidweber.de/albums/venice/. Phillip, your review and this spirited comment chain have pushed me over the edge in deciding to make the Voigtlander my first lens for my first camera in this class (A7s). Looking forward to a low light, small set up. Thanks for the info! 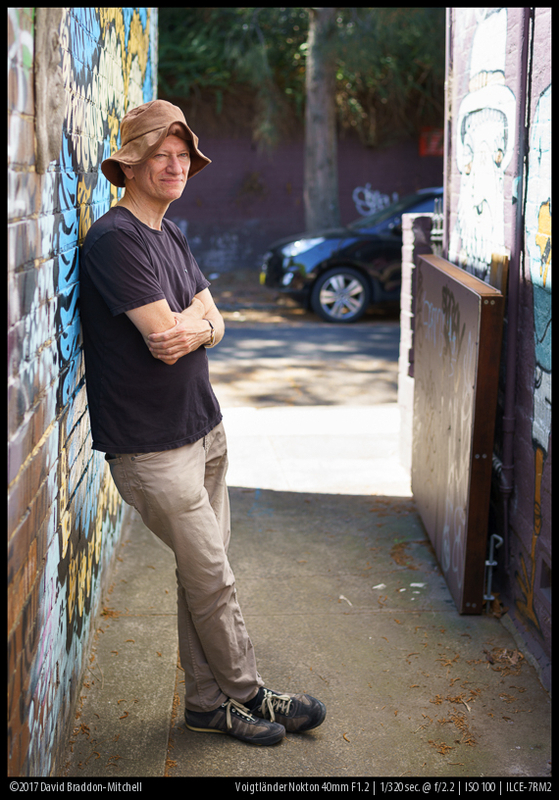 Correction: David – thank you! A few questions. How would this lens perform on the original A7s? Would the results differ significantly due to pixel size? Also would the purple fringing be more or less pronounced? Thinking this would pair well with the Loxia 2.8/21. 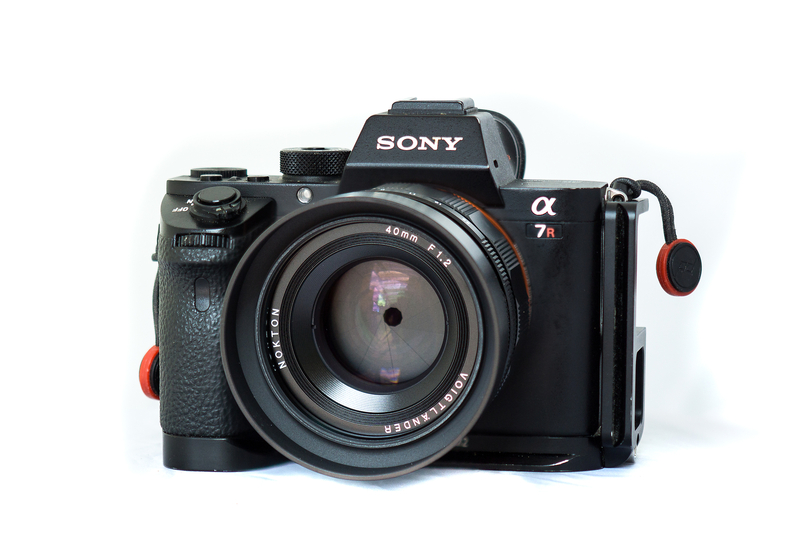 And lastly what L bracket/grip are you using on that A7R at the beginning of the post? Thank you for your review of the 1.2/40. Love the site. Purple fringing, when it is LoCA, is not affected by resolution or pixel size. Having said that, there is a tendency to compare images between cameras at so-called “lifesize” or 1:1 — i.e. one pixel on the sensor mapped to one pixel on the screen. The higher the sensor resolution, the more magnified the screen image you are viewing is: so it can seem as if there are more problems with the greater resolving sensor, though that wouldn’t be true comparing images at the same area magnification. So, no problem on the A7s. Thank you so much for your detailed response David. It’s nice to know some of these things won’t make much of a difference on the A7s. Probably going to pick this one up if the short focus throw doesn’t bother me. Never had a lens this fast so we’ll just have to see. Even after shooting the Loxia 21 quite a bit now I still bump the focus ring more than I’d like. I might have the same issue with this Voigtlander. Excellent review David. How would you compare the overall performance against Loxia 50? I’m looking to add an MF lens to my arsenal, and currently torn between this 40mm 1.2 and Loxia 50mm. Sorry not to have seen this earlier Norman. Astonishingly, the Loxia 50 while very good is not I think for practical purposes all that much better stopped down for landscape. They are both excellent. Of course the Nokton is much faster, and that can be very useful. The Loxia is a better but not hugely better when both at f2 (though it has less field curvature). The both have lovely sunstars. The Loxia is better behaved: field curvature, focus shift, and LoCA at wider apertures is less. But I don’t think performance differences are large enough to make that your decision point. Do you want 50mm or 40 is the big one. 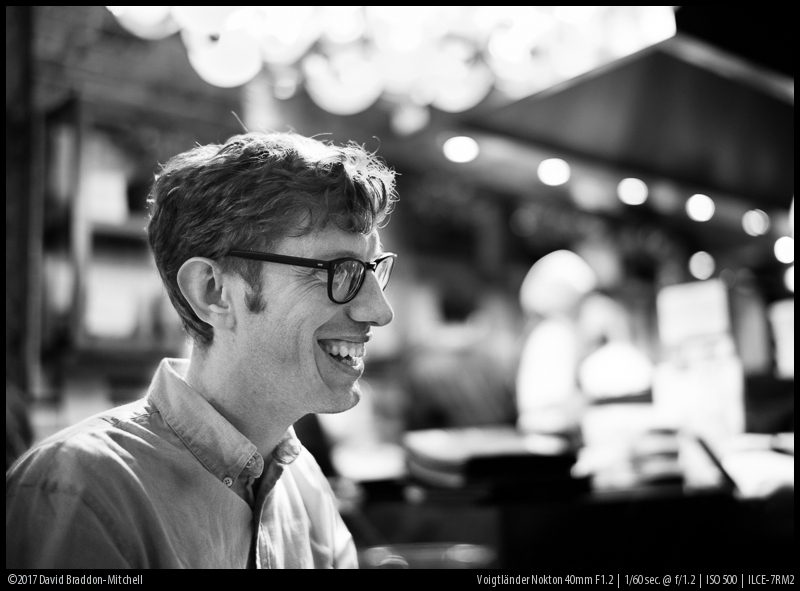 (remember than 40mm f1.2 is equivalent in blur to 50mm 1.4 or so, so the Loxia while slower has only about a top less blur). If you aren’t sure whether you want 50 or 40mm, then it’s really whether the f1.2 for creative effect is worth the tradeoff in size and weight (the 40 is a bit bigger) and having to be a bit careful working around its aberrations at wider apertures. I’d probably choose the 40 if I had to, but it’s very hard to guess what I’d do given I don’t have to! then a lens must be judged according either to bokeh or sharpness. Instead we see one lens from both point of view and complains about the size and cost of Otus. 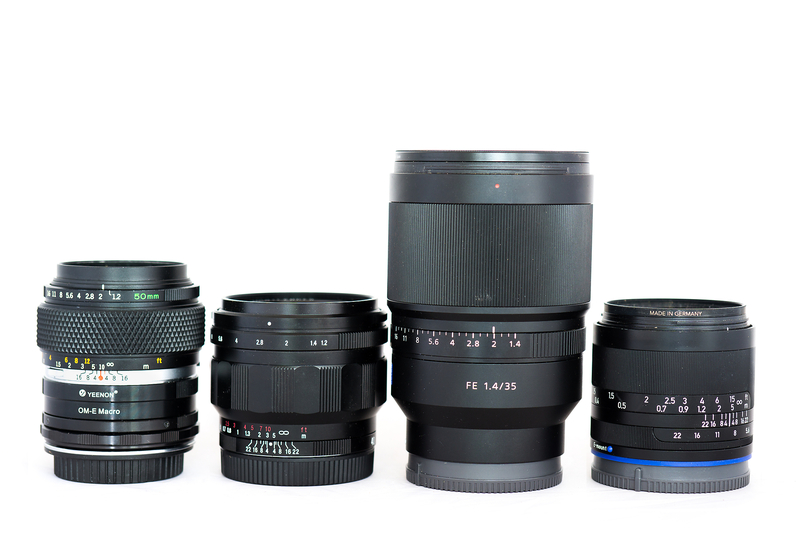 There are (at least) 4 classes of lenses. (2) Fast and balanced. Soft corners wide open, a few concessions to aberrations, but sharp in the middle wide open and sharp stopped down. (3) Slower or moderate fast but no compromise. As you say, far too few of these. The best way to get Otus quality without the size or price. Batis 135, CV 2.65, Loxia 21 and 85. The greatest confusion in lens reviewing is talking about one lens, and then complaining that it doesn’t do something from the another category. In my opinion in the case we are speaking about photography we must start from the subject. At 28mm is no point to emphasis something in favor of other thing (English is not my language) so f/11, f/13 and so on is all that you need with minimal distortions. Postcard 35mm, 40mm, 50mm, even 85mm f/8 is good for contrast. If you want to draw attention on someone eyes you do not care about door handle (see above), corners, vignetting and so on. All you need is a lens with shallow deep of the field and of course the eyes. But if you want to discuss about lenses and not about photography then we look at situations that does not fit with lenses characteristics, and what a surprise there is not an ideal lens: light, sharp all over the frame, and so on. Bokeh is not digital blur (IPhone). Without bokeh full frame DSLR are obsolete. In real photography (film) you must to have vision and to nail that unique 1/1000 second. I would appreciate it if you kept your comments a little closer to the topic (CV 1.2/40 in this case) and a bit more nunaced. I have been taken by some images and I did not observe that is a wide analysis of a lens. For me reading some reviews like the one about Jupiter 12 and this one were very helpful. I do not like to use a phone camera, but I was stricken how good can be the IPhone for the most common photographic situation and also in landscape photography. About film photography what I intended to say is that is about a unique moment, a meeting between a fraction of a second and immortality. You got to be prepared to have the right lenses or vision, because lenses are the vision vehicle. You can not review and adjust the exposition, you can not turn the time back. I came to this site by accident. I am not a Sony shooter. I am in the hit or miss photography, and a lesser Photoshoper (photography and Photoshop are opposite). Recently I bought a superb Kiev 4 (Zeiss Contax II clone) camera with an outstanding lens Helios 103, a Russian variation of Sonar 2/53mm, and I was trying to find something about Jupiter 12 lens (without the Russians, the legacy of the fabulous German technique would be lost for ever. Now anybody can buy a cheap Russian variation of German Biotar and go far beyond the IPhone. It is not funny?). Lets come back to the lens testing. Is the lens an optical device or a photographic device. Almost all reviews plus MTF charts, plus DOX perceptual mega pixel regard the lens as an optical device (the IPhone is the perfectly stupid clinical lens/image). Photographically that is irrelevant (who cares about corners, in old prints corners are totally missing, flare – fake it digitally, and so on). If the image is strong enough the lens does not matter. Frank Capa (D-Day) or Henry Cartier Bresson (at f/8 any lens is more then good ) images are proofs beyond doubt. So if the test charts are photographically irrelevant how to perform a test? Anyhow photography is an isolation of the entire scene. With the lenses you can further away emphases something in the picture. The zooms are giving a kind of isolation (it is hard to know for a distant object what is the appropriate focal length. The primes give you the possibility of a better control on DOF. As a real time shooter I have to know in advance the lenses. At a certain distance what focal length and what DOF (aperture). Look at a picture of Larry Burrows, he had carried 4-5 cameras for 4-5 focal length (maybe all Germans 🙂 ). So what lenses for the picture? GermanCameraHunter for the Japanese cameras there is one. Can anyone compare this lens to the CV 35/1.2 II ? None of us has the 1.2/35 I’m afraid, nor is likely to get it. From what trustworthy sources have said the 40 has a similar look to that good lens, but is a bit better in every regard. Can you compare this lens with VOIGTLANDER ULTRON 1.7/35MM? for sharpness and bokeh. I ask because i’am looking for all-around lens. My type is ultron 35/1.7 or this one. And another question….which one of this do you prefer? Still waiting for my 1.2/40. In the “where can I put the eye” section, did you put the eye in the center of the frame, focus, and then move it out to mid/corner for the final composition, or did you first lock in the composition, then focused the eye in place, while presumably moving the focus magnification zone to wherever the eye is? Trying to discern how much of a hassle the field curvature is. I’m more of a person that focuses in the center and then shifts to the final composition. It’s what goes easiest with sony’s focus magnification. Having to move the focus magnification area to other spots on the screen seems like a painful hassle that detracts from the joy of it all. What’s your impression on this? Previous comment hit on this, but I’d be curious for a direct comparison – I’m weighing this lens vs the Loxia 35/2 and can’t make up my mind which to go with. If you hadn’t to pick one, and generally had a preference for both a) shooting wide open and b) sharpness. My primay lens right know is the Sony Zeiss 55/1.8 which I love and is nearly the perfect lens for me. Looking for something like that, just with a wider field of view. The Loxia is in my view slightly preferable stopped down … but really there’s nothing in it. The cv 40 is better at f2 than the Loxia, and has all the faster possibilities too. For landscape choose on focal length, if you want all purpose choose the CV. If you are a keen modifier and don’t mind sourcing and adding the appropriate pcx front filter, the cv 1.7/35 is another alternative that might be even better than either from f2, but doesn’t have the blur potential of the 40. Now that there is also a M mount version of the 40 mm / F 1,2 Nokton. Any thoughts on getting it for use with the techart adapter for optional AL (at the loss of auto magnification) instead of the E mount version? Looking forward to comparison with 35mm 1.7. If the recently announced 21 and 110 prove top notch (which I’m fairly certain we can place a wager on the 110 already)..the that would make quite an attractive 4 piece setup. Thank you for the great and helpful review. I asked this on FM too, so maybe some people see this question twice (sorry). Wanted to know if this lens will do well at 2.8 for astro pano’s. I know it has coma and aberration trouble wide open, but 2.8 seem to be good (?). 2,4 maybe also, or am i asking too much? So will it work on a Sony A7III? I think or pano’s 50mm 2.8 is not a unusual (to correct the biggest flaws and make stitching easier) and should not be no big problem for noise with the A7III ? Coma is pretty well controlled by f2.8, though there is some mild deformation in the extreme corners still. Not enough to mess us stitching I think, though I haven’t tried using it for astro. Noise is of course up to your tolerance level; though the A7rIII and A7III have impressively low high ISO noise. There is of course a tiny grain of truth in what anti-Sony trolls who say “Can’t use Sony cameras for astro”. It’s that while the latest A7 cameras are class leading for high ISO short exposures, they are not class leading for long exposures. While obviously they are very good, some of the DSLR competition has fewer variable hot pixels (that can’t be mapped out) and general long exposure noise with long exposures. This is probably why Sony won’t remove the star-eater algorithm after 3.2 seconds. It is very likely a result of the form factor: the cameras are very small and so heat build up is harder to dissipate. This trade-off absolutely works for me; and I think they are great for astro. But they wouldn’t be my choice if I were, say, a professional astronomer..
I’m about to buy the Sony a7III (with the Laowa 15mm 2.0, the Zeiss Baris 25mm 2.0 and this Voigtlander 40mm f1.2) in a few weeks. The “star eating” thing really bothered me when i first red about it. Then after some searching i saw beautiful examples of people who did not have any problem with it, while the first ones i looked totally unsharp! Now i’m doubting; so apparently the problem still is there, but is there no ideal setting to work around it, and how bad is it if you do every thing right? Star eating is not a problem for people who are doing starry landscapes etc. 1 pixel sized stars are not visible in prints of any size viewed normally, and on most prints regardless, nor are they visible on large high rez screens. So none of the stars that might be “eaten” would have been visible anyway! Star eating only matters for professional astronomers who might, e.g., have to count the number of stars in a region. And it does not affect sharpness. hi & thanks for the detailed review. i am relatively new to the sony a7rii, and *i think* i am certain that i am looking for a 40mm prime – i know 50mm will be too narrow for me, maybe 35mm could be an option as well, so: i am going back & forth between the loxia 35mm & this voigtlander, but i have also come across recommendations for the leica / minolta m-rokkor 40mm – and this would mean a significant price reduction including an adapter. i am not really needing the incredible speed this voigtlander lense here offers, really i am just looking for overall performance. 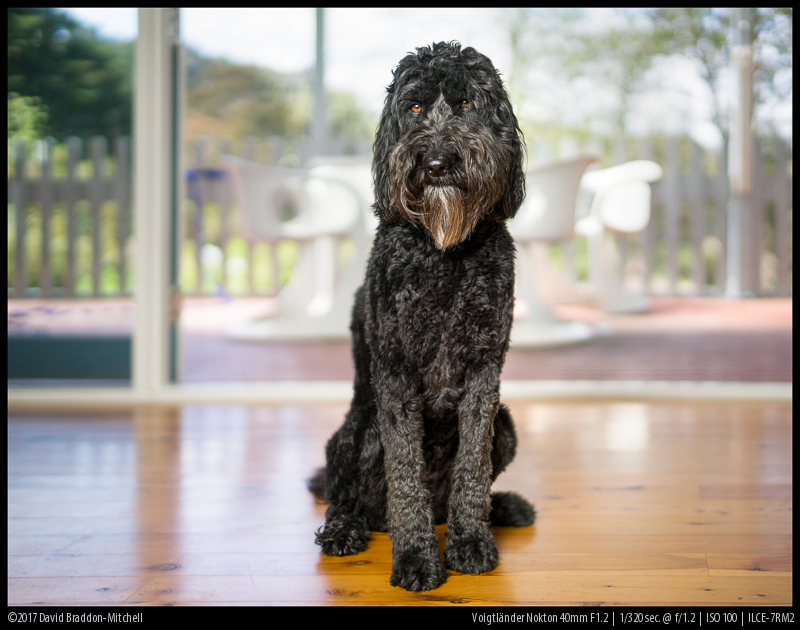 but if anyone could advise me how the leica / rokkor 40mm compares to the voigtlander in terms of image quality when stepped down to f8 – i would greatly appreciate it, thanks. I haven’t used the old leica/minolta 40 for a long time, but I do have some old images. It was a great lens in its day, and stopped down performed pretty well. But not as well I’m afraid as either this CV40 or the Loxia 35 (The CV 40 performs better than the Loxia at wider apertures). ..great review…till now I finde it the best off all…thanks a lot! From what I’ve read so far, the Sony 55mm looks to be great for portraits with nice character. I’m concerned it might be a little too narrow. But the 35mm lenses are either massive (which Rules then out) or slow ( less possibilities for creative fun with bokeh). So I’m really intrigued by a fast 40 like this one. I’ll prob also get an AF zoom like the 24-105 or maybe the Tamron 28-75 when it comes out. In your opinion how easy is it to use a manual focus lens on the Sony as more or less a beginner? And for the results I’m lookong for would you recommend this over the Sony 55mm? What do you think would make the best combo for enviro portraits and general use? Very good Review with good sample Images. Thanks a lot. thank you for the very detailed review which gave me the final kick for my decision. In earlier days I have photographed a lot with the Tessar 2.8/45 (on a RTSII). This was my favourite combination. 35mm for me are to wide-angled, and I never liked 50mm. Nevertheless, while reading your review, I was afraid, that the CA could spoil the whole fun of this lense. This week, I got a good offer of a nearly new 1.2/40 for my a7RIII. I tell you that I don’t regret having it bought! Yes, under *certain* circumstances @1.2, the CA is really annoying! Also flare @1.2 is disturbing (only!) a little bit with the sun in the frame. But, to be honest, this is no problem at all. Because, I can “correct” these “flaws” easily by changing the aperture. Besides my Heliar 15mm and my Loxia 85mm, this lense will become something like my “every day” lense. I already love it, although I haven’t photographed much with it yet. I got the “fantastic” 35 1.2 vii, I did an “unprofessional” vs with my 40,…the 35 is on ebay, but really interesting in this one since the sony or the samyang, sigma are giant!. I really enjoy it using the techart pro on a7iii where you get eye af in continous af, it track the eye person incredible well. The 1.4/40 CV is a very old design, which has only a tiny central area of sharpness at wider apertures on Sony sensors due to ray angle issues (and it’s not even that sharp on film or leica), quite low contrast, and even stopped down does not have much sharpness in the outer frame. There is no design similarity between this and the recent one. The latest version of the 1.2/35 is in some ways similar to the 1.2/40 in design, and is not a bad lens at all, though it’s not quite as good as the 40. Could you please explain the differences between the two lenses a little more? Hi, I am a beginner and purchase a used A7Rii with brand new Voigtlander 40mm lens (this lens in review). Because, zoom lenses were expensive especially good ones. Now, I have choice between Tamron 28-75 (launched this year), or Sony’s 24-105mm which has some complaints and few people had to return or this old Leica SH 28-70mm f/3.5-4.5 Elmar Vario R (ROM). About Tamron and Sony the issue is that both cost over $1000, though new. I wonder if you have tested this Leica or Sony’s 24-105 and recommends, which one is better. I am getting Leica for under $600 (without adapter). By the way I like to try astrophotography (apart from standard day-to-day travellers use) but I have read that it could still be done using f3.5 (for example done using Voigtlander 15mm Heliar f4.0). Not everything with a Leica dot is worthy of the name or the asking price. This is especially true for the Leica-R lenses. and those will be hard to find for less than 2000$. pay the price for it and it is usally backordered. Whether you want the Tamron’s f/2.8 aperture or the Sony’s 24-105 range none of us can answer for you. We have an article on Best lenses for Astrophotography and in my review of the Voigtlander 15mm 4.5 I cover that topic as well (that lens would not be my preferred choice for this task). I also have to point out we are a blog for lens and accessory reviews. and it takes away from our time that is better spent elsewhere (e.g. new articles). so we get a small comission for our consulting time. I am pretty sure that Leica is a rebadged Sigma lens. Hi, I’m also late to the party but that won’t stop me from bothering you with my question. You found out that close distance performance is vastly improved using such a lens. My question is: what is the maximum magnification with the Raynox or Nikon 5T – and is it useable? To fulfill my needs I need a do-it-all-lens that goes down to ~1:3 reproduction ratio. 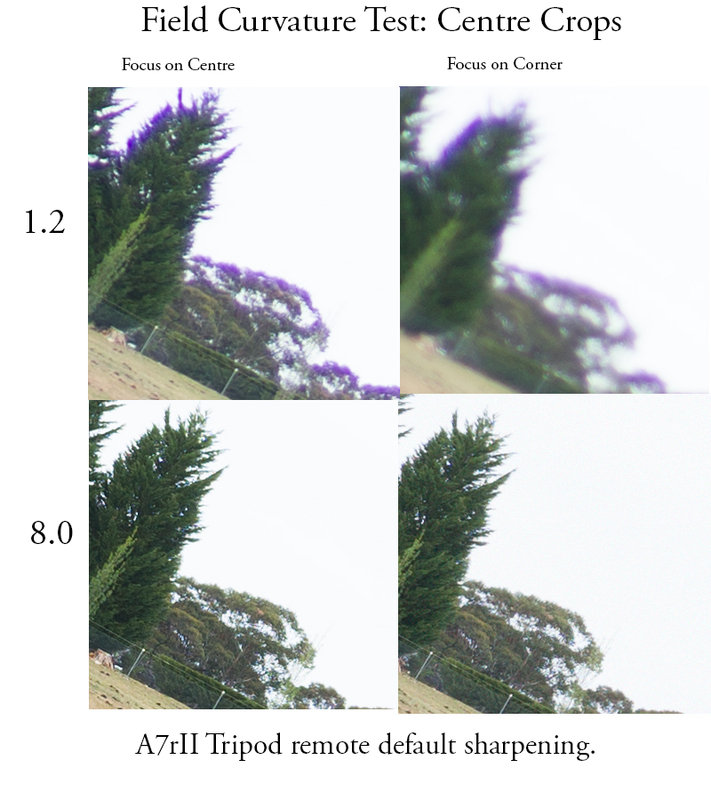 The samples with the diopter lens looked very promising, so I’m hoping that it A) allows much closer focusing and B) accepteable image quality. Magnification depends on focal length of master lens and focus distance. focus distance depends on the diopter. It’s basically 1/Diopters in meters. So a five diopter lens focuses to 20cm when the master lens is set to infinity. I leave you to calculate magnification for different lenses focussed at 20cm! Yeah, I figured out doing some research myself before I ask such a question wouldn’t be a bad idea. Let me be more specific: with this 40mm lens and a 1.5 diopter lens I could go down to 26.7cm and something like 1:3.5 at infinity. So image quality should be as good as the examples from the thread, right? For anyone interested: I got the numbers all wrong. To reach 1:3 with this 40mm lens, you need a 5+ diopter. At infinity, you’d still have 1:4.7. Dear Phillip, I’m waiting for a review of Batis 40 from you. I hope Zeiss could bring a great competitor to match the CV 40 F1.2 with the AF and very close focus feature. Please 😀 give us an overview of the Batis 40. The Batis 40 is available on BHPhotovideo right now!!! Not likely to happen with the AF issues and Zeiss not being very supportive to independent sites like ours. Just wanted to show appreciation for your great work! But this Voigt lens is my body cap usually stays on for most of daily shootings. I really agree with your point of this lens balancing out really well without major compromises in any single criteria. Looking at your review helped me get more IQ during some moderate landscape shot. Please continue the great work! Since I first checked your full-size samples, this very one left me highly confused. The EXIF says it was shot at f/1.2 but the lack of any softness – especially give the short subject distance makes me wonder if the CV40/1.2 I used was an entirely different lens. Below 1m/3ft mine was disappointingly soft. So what’s the secret here? A close-up filter? Actually shot at f/4? Ah this was a long time ago. But the exif wont be wrong. It’s possible I was trying out an achromat filter – they do hugely improve close up performance – though I thought I hadn’t tried that until after the review. 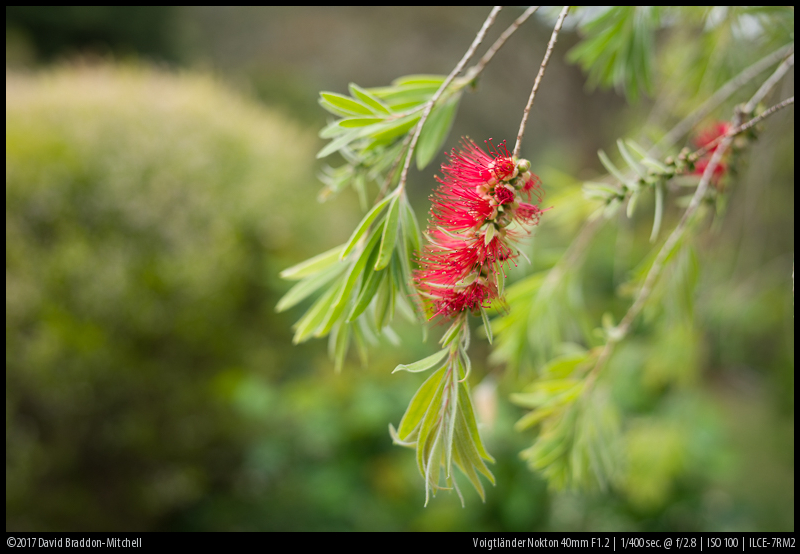 One thing to note is that the high resolution images on smug mug, while higher than we can post on the blog, are not the full 42mp, so viewed at 1:1 will appear sharper than 1:1 from a 42mp file. But srysy: I use the Elpro 4 myself on a CV 40/1.4 and can confirm that. 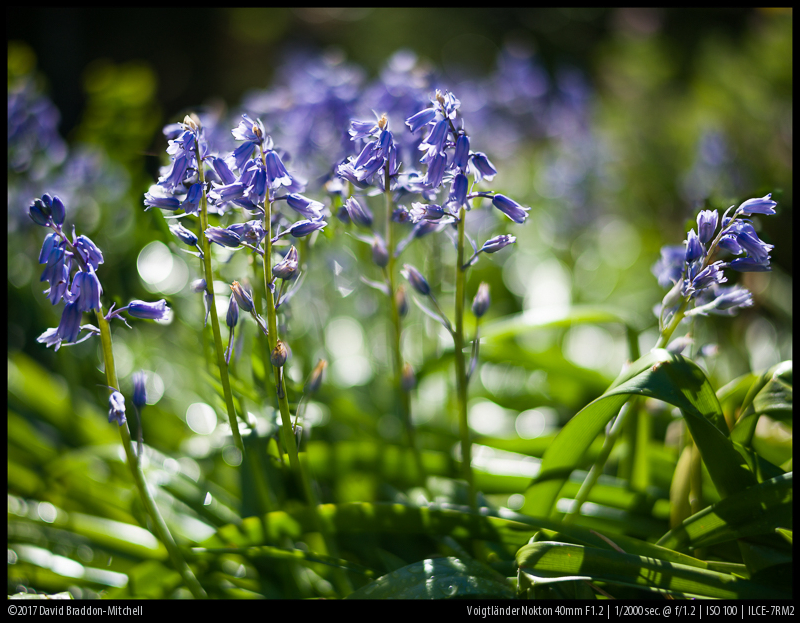 But even if yours was with an achromat, this is a remarkable performance for f/1.2! Since I only have 24mp at my disposal, the “fake” full size should actually match what I would get. Your copy seems to be considerably better than the two I have tested. Yes I agree it’s remarkable, and better than I would expect with my copy. So maybe something has gone wrong; but I’m afraid that I can’t tell what if anything, since I don’t archive the originals. 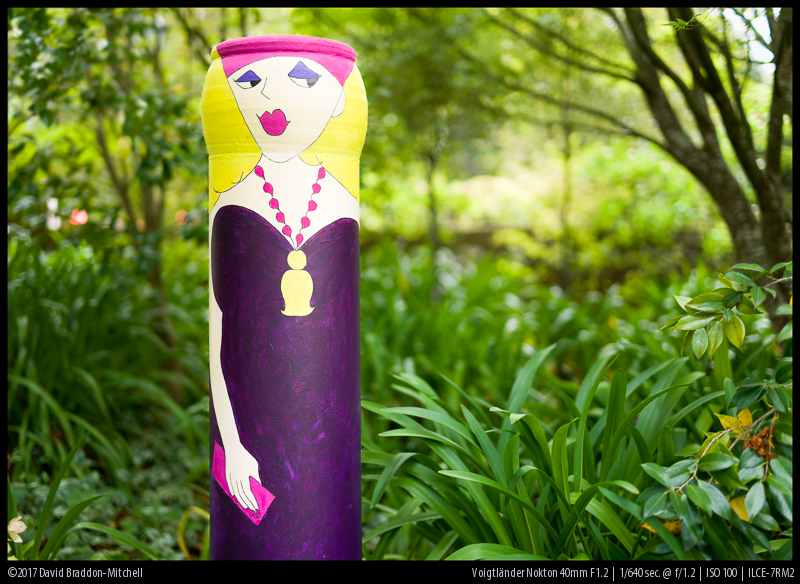 The bokeh looks right for wide open at .6 metres. At one point I experimented with focus stacking – I’d suggest that maybe I inadvertently posted one of those, but I thought I hadn’t done those experiments until after the review. I’ll add a comment in the review that the in focus areas seems a bit odd. Glad you have the Elpro; it’s small and really makes the lens more versatile.